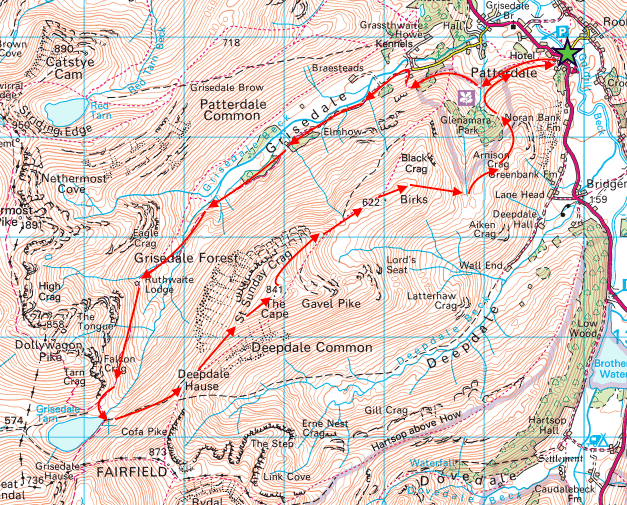 We haven’t been out since 23 May for a number of reasons, chiefly though because of the cold, cloudy weather. 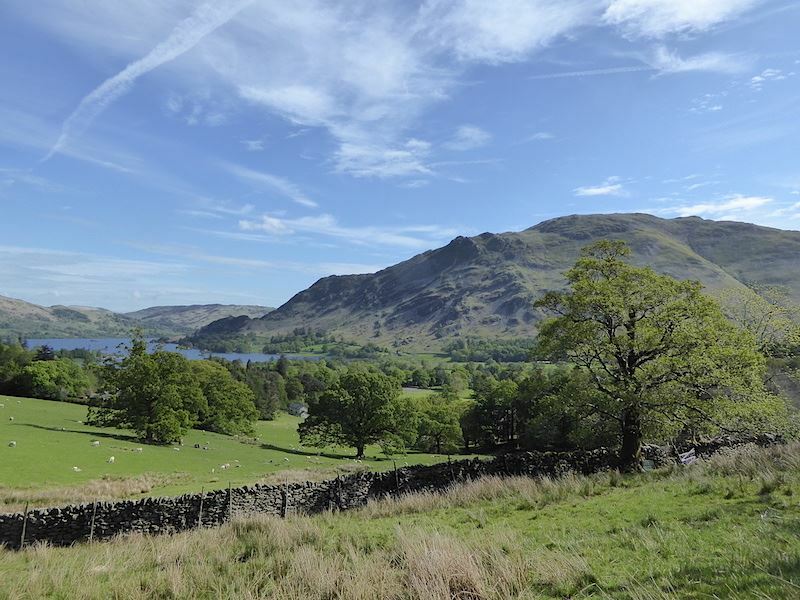 May has been a cold, very windy and wet month and the start of June hasn’t brought a great deal of change. 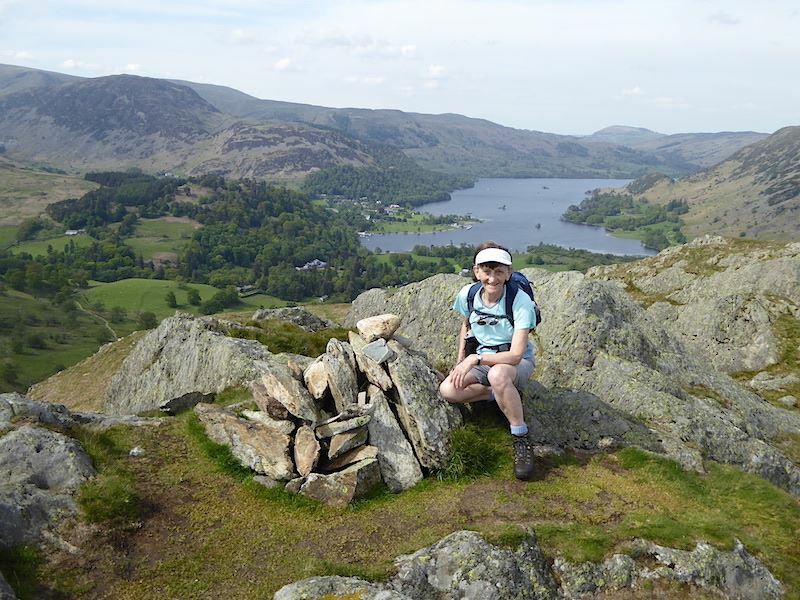 However, today was forecast to be a little better so we drove over to Patterdale for a walk up Grisedale and on up to Saint Sunday Crag, Birks and Arnison Crag. 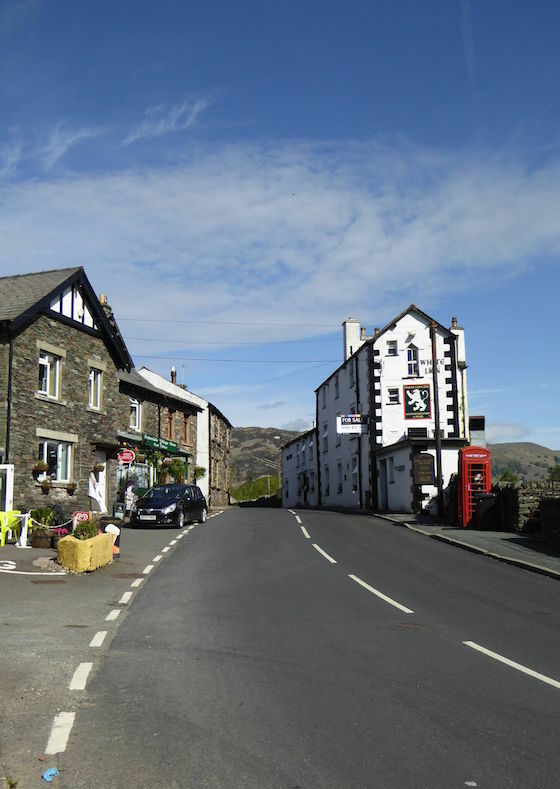 The picture shows the White Lion and village store in Patterdale, the start point for the walk. 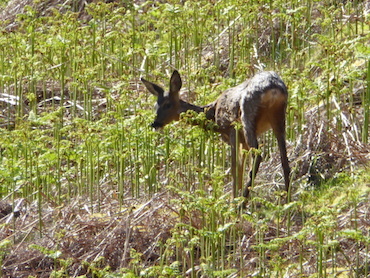 As we walked over the fell sides below Glenamara Park a sudden movement caught our attention and seemingly out of nowhere a couple of deer appeared. 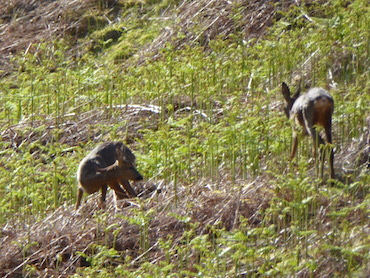 I had to use the zoom as they were quite a distance from us, and they seemed to be as curious about us as we were about them …..
On with the walk and a nice view of Birks as we pass through Glenamara Park. 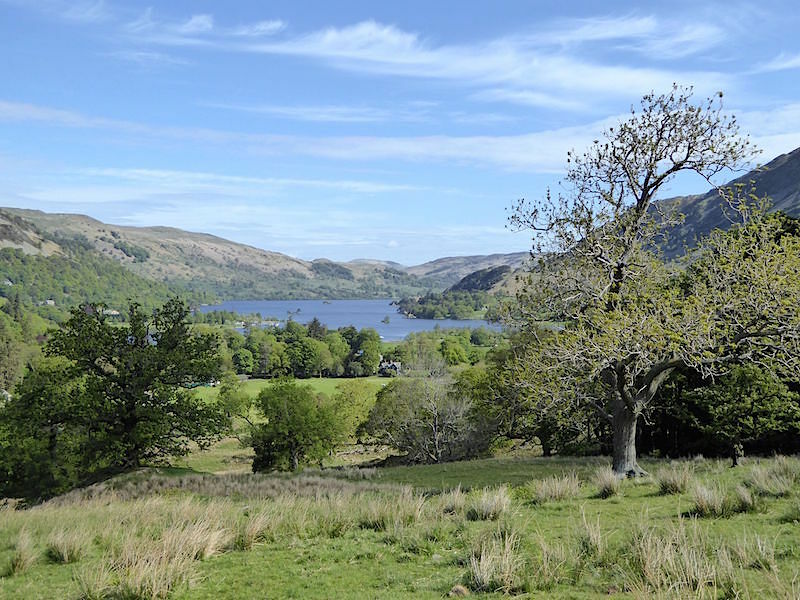 Looking along Ullswater from the parkland. 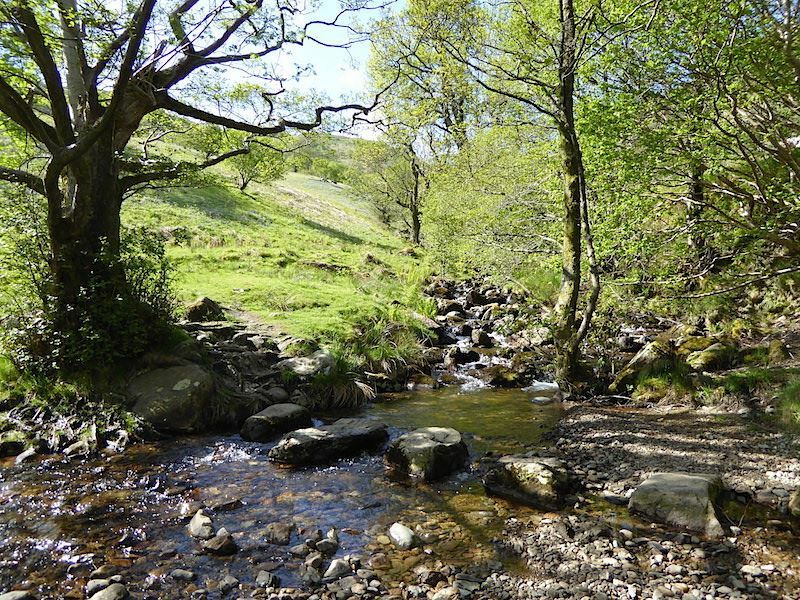 A look back at the stepping stones across Hag Beck. 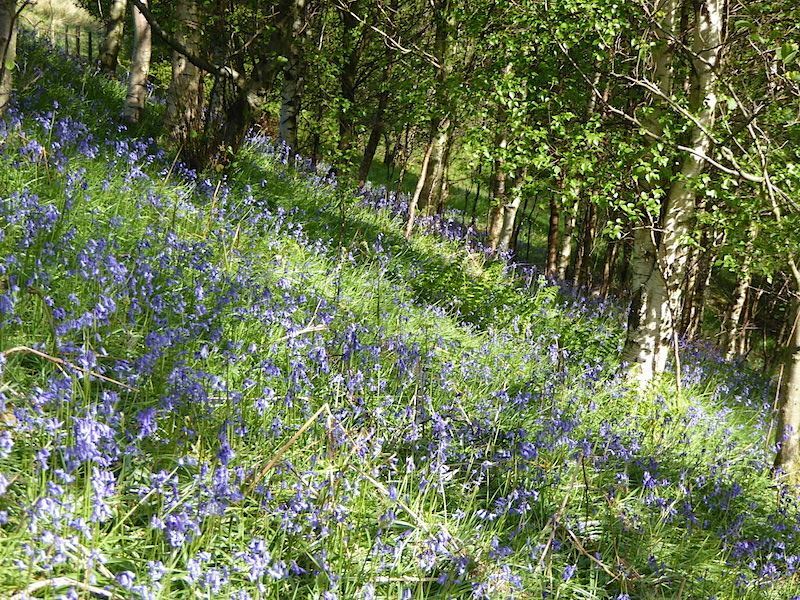 Bluebells in the parkland, they were late to flower this year so perhaps they weren’t happy with the weather in April and May. By the way, they were growing on a very steep hillside just in case you’re thinking that I don’t know which way is up. 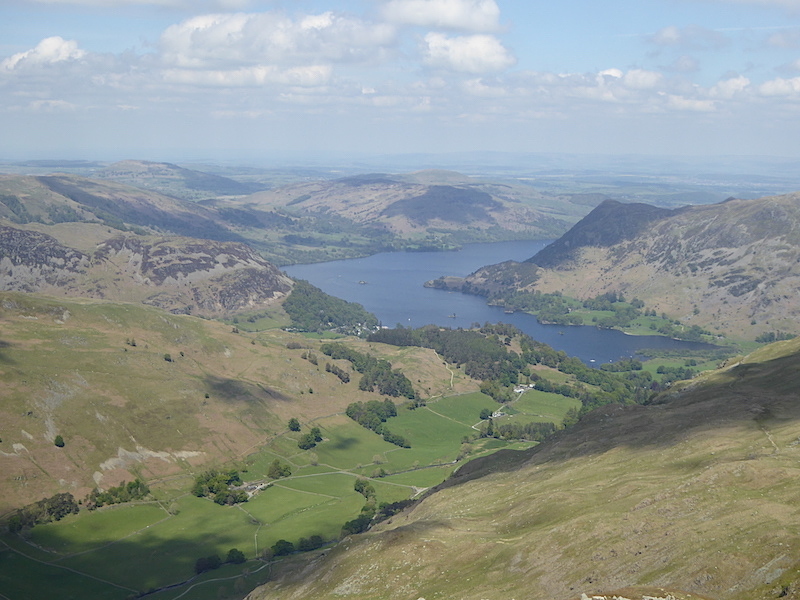 A look back at Place Fell rising above Ullswater. 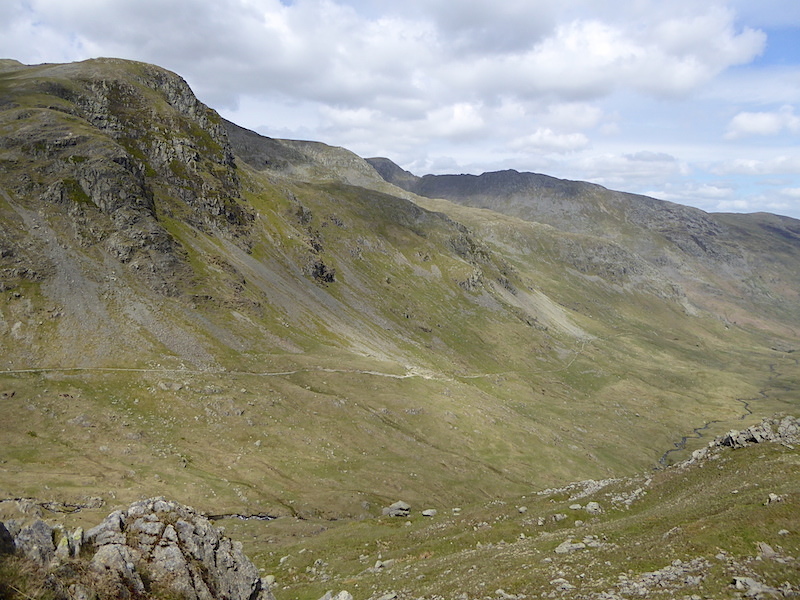 Out into the open now and heading into Grisedale, the Helvellyn range over on the right. Alongside the path we came across this very large boulder serving as a cornerstone for the wall, quite ingenious I thought. 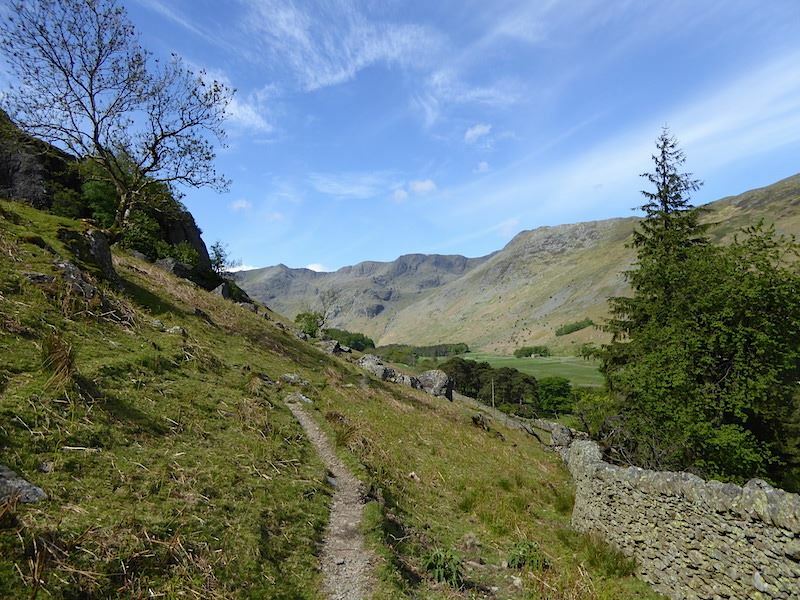 Following the Grisedale path on a lovely if rather chilly morning. 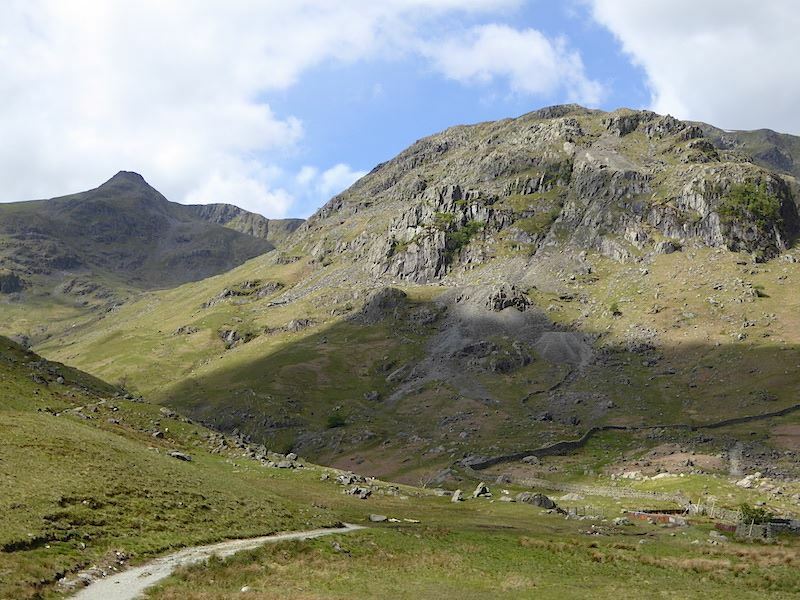 That’s Saint Sunday Crag, but it’ll be quite a while before we are on the top though. 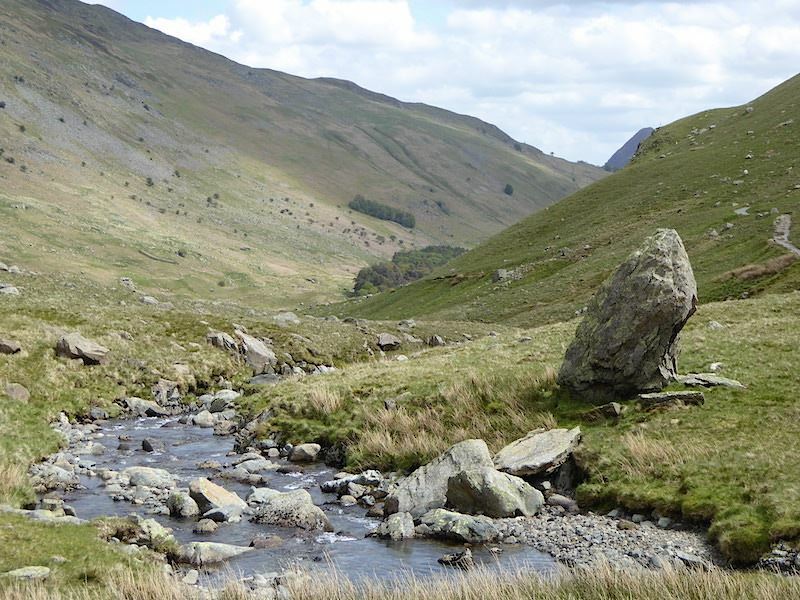 Another look back along this lovely quiet valley with Place Fell dominating the view. 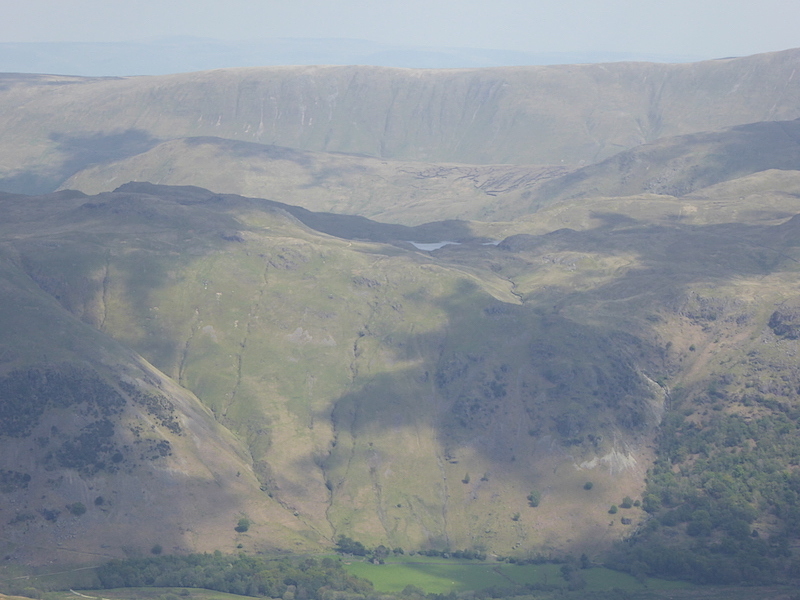 The dramatic scenery of the Helvellyn range, a tiny patch of snow still clinging on, over to the upper right of the photo. 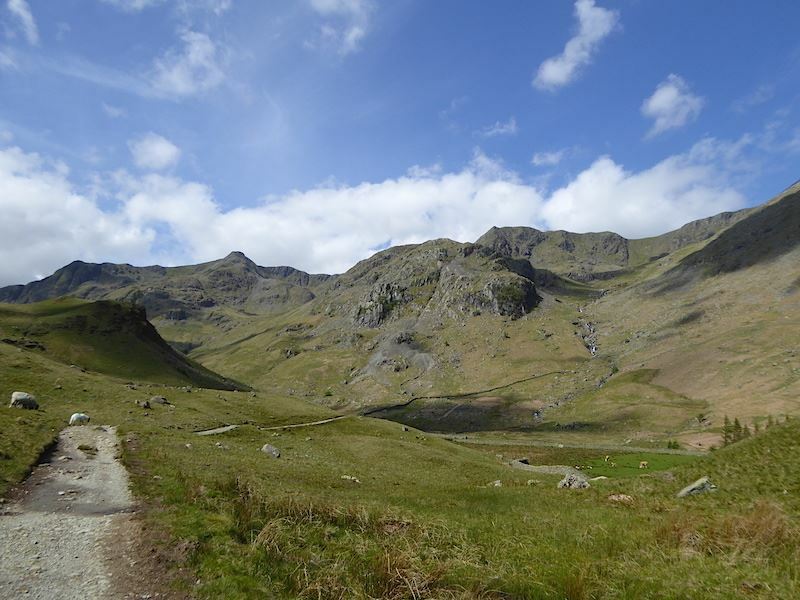 The scenery becomes ever more impressive as we walk further in to the valley. 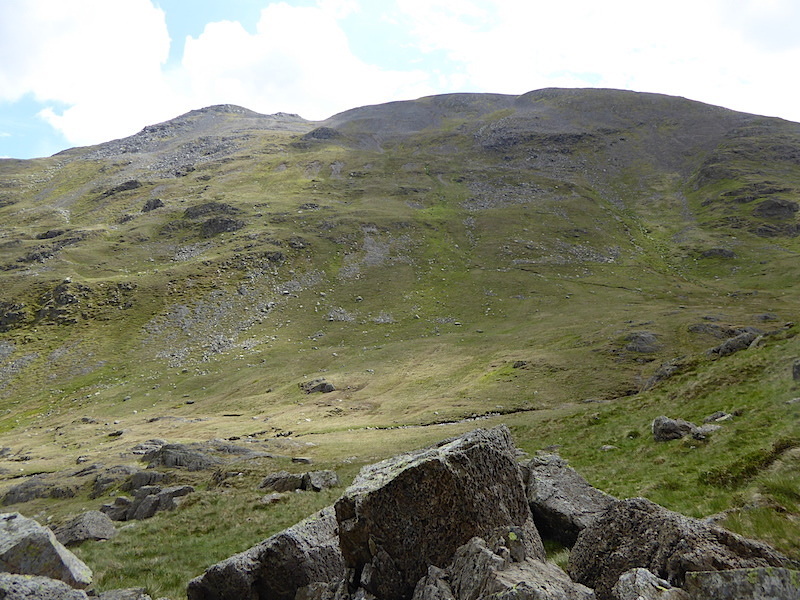 Looking up into Nethermost Cove, a patch of snow still on the flanks of Nethermost Pike. 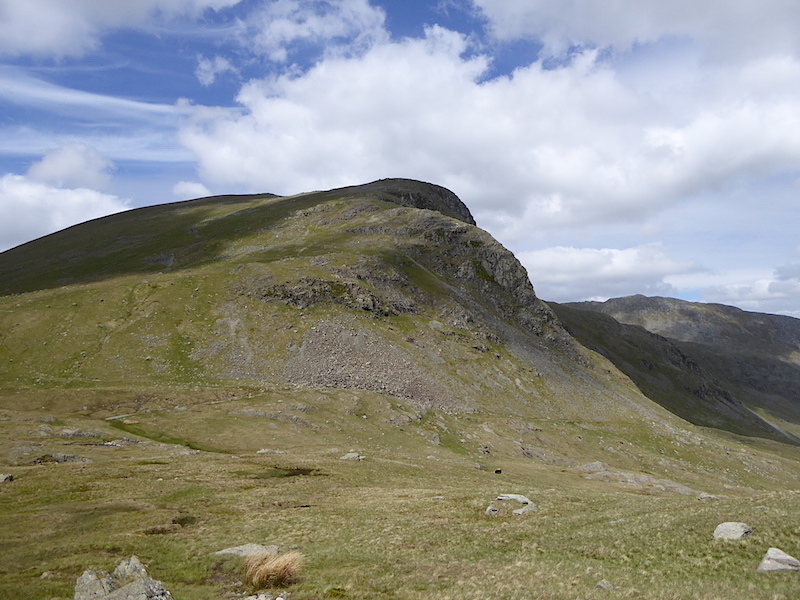 In the foreground is Eagle Crag and over on the left is The Tongue. 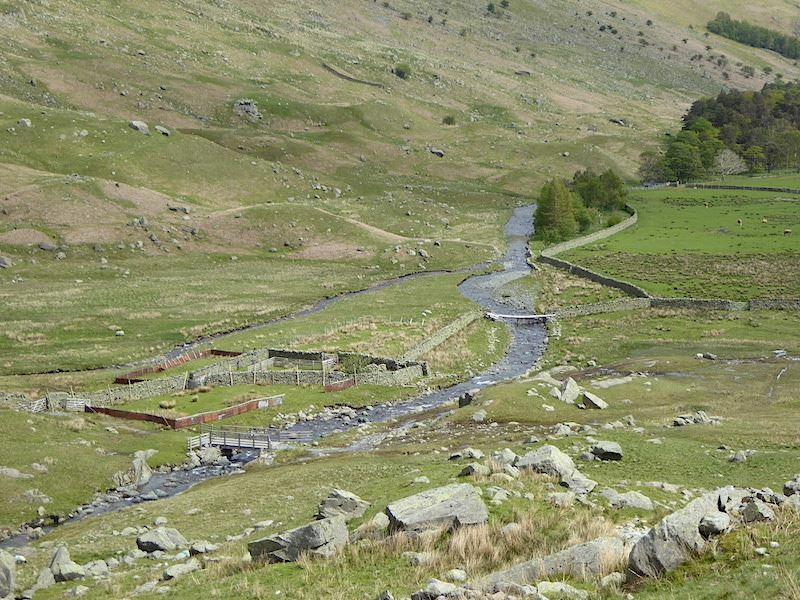 The large sheepfold at the confluence of Nethermost and Grisedale becks. 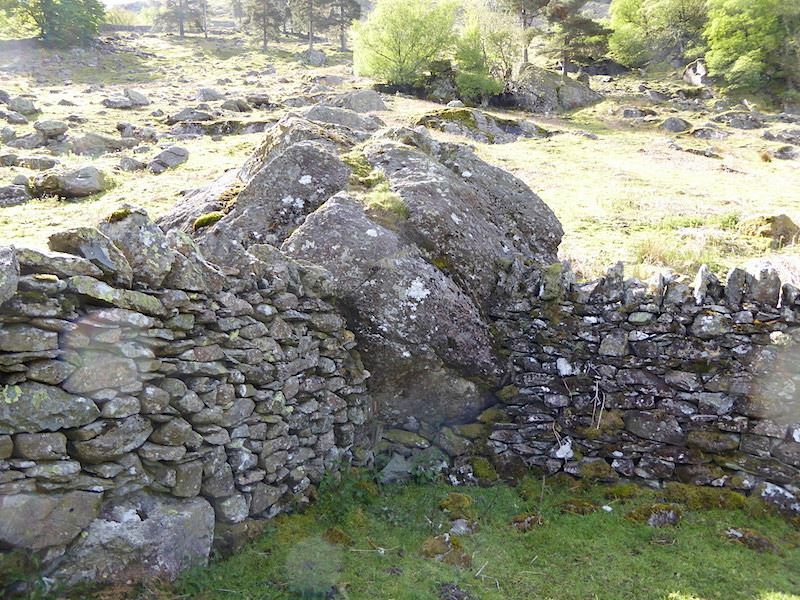 A closer look at the sheepfold. 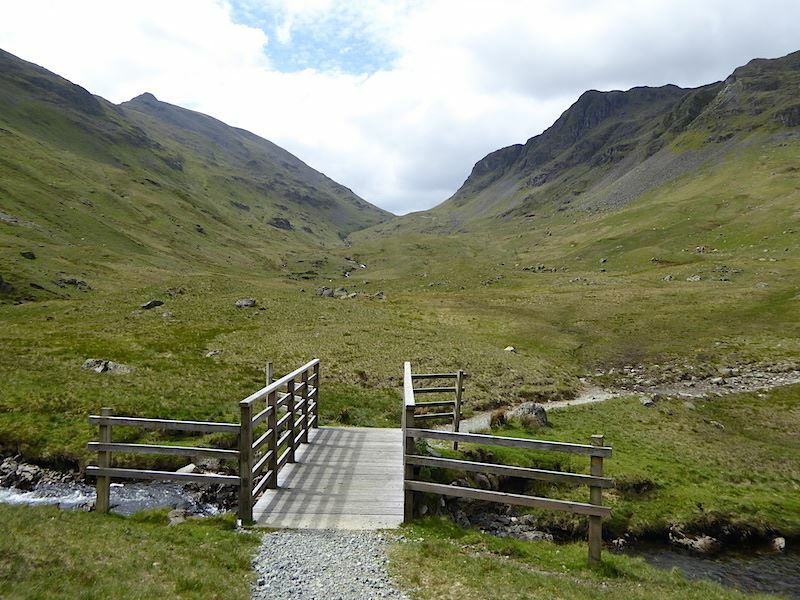 Over the bridge now and a right turn to head for Ruthwaite Lodge. 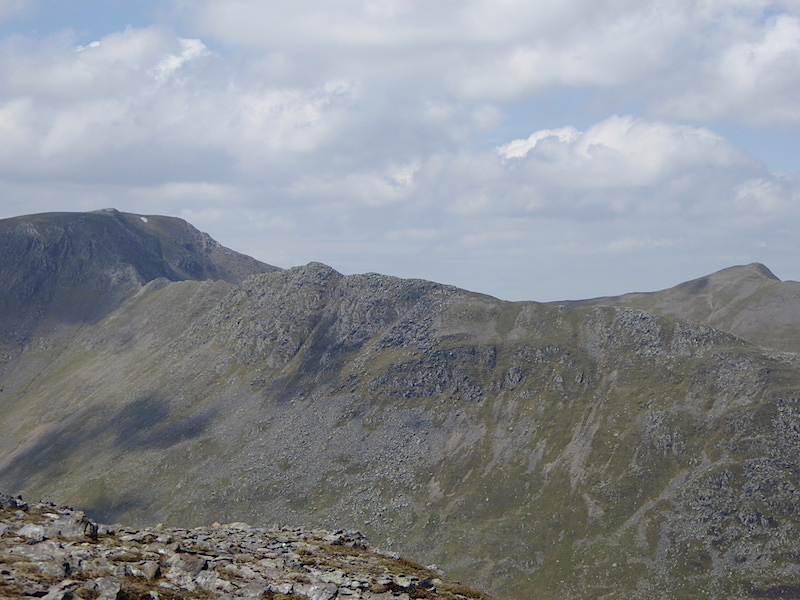 The peak on the left is Cofa Pike. 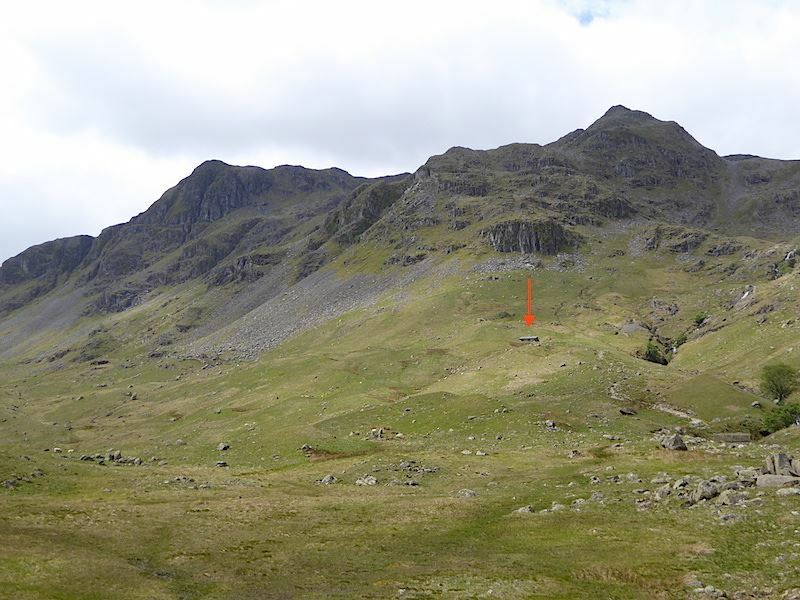 Ruthwaite Lodge comes into view, the long low building just below the arrow. 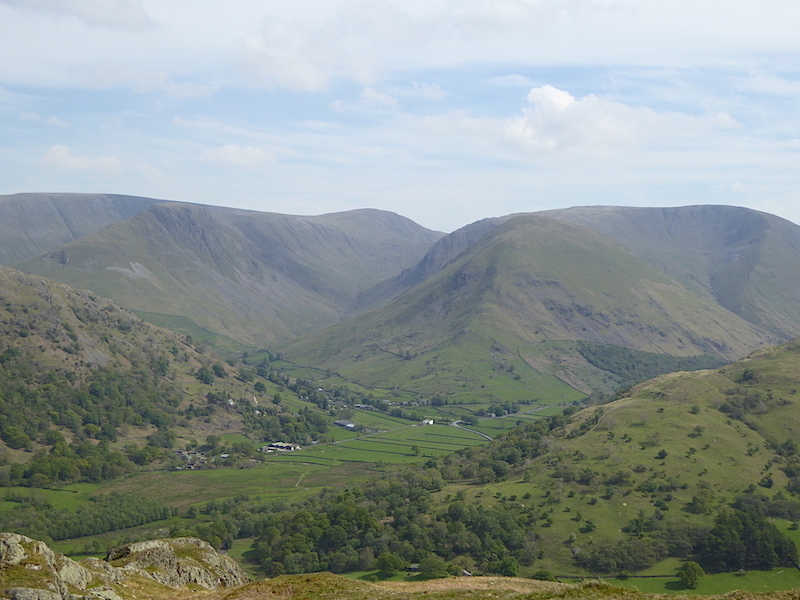 The long views down the valley have now gone as we climb towards Ruthwaite Lodge. 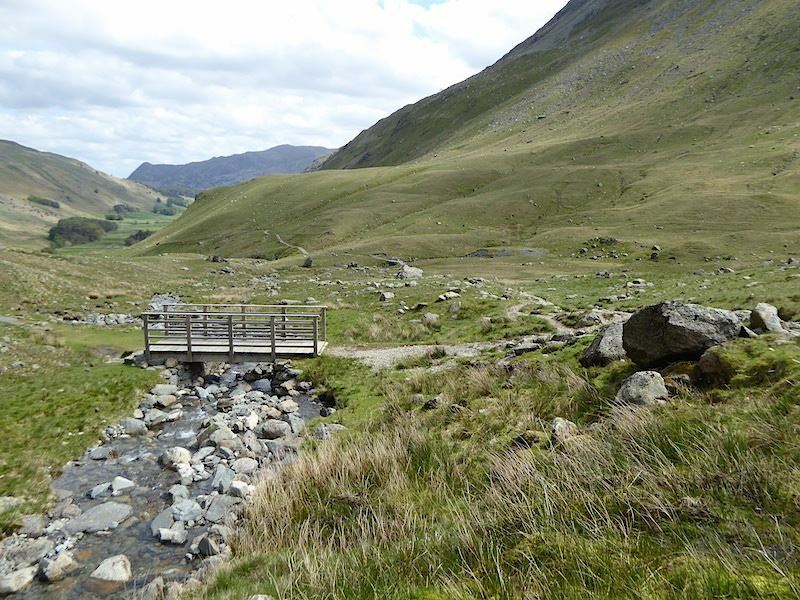 The paths along each side of the Grisedale valley become one just by the bridge. Ruthwaite Lodge, pronounced Ruth’et. Thwaite on the end of a word is a bit of a tongue twister so it often gets shortened to just ‘et. 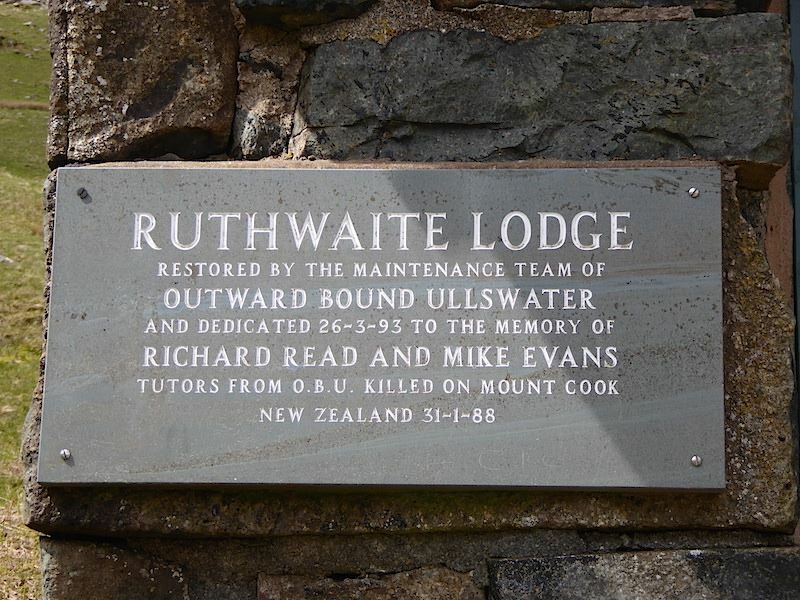 The dedication plaque on the wall of the Lodge. 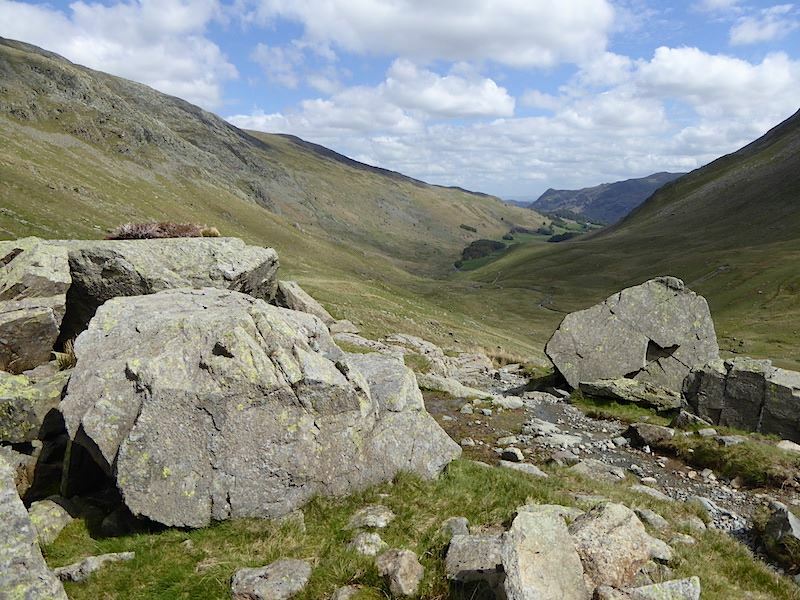 Another look back down the valley, there are some pretty big boulders around here. 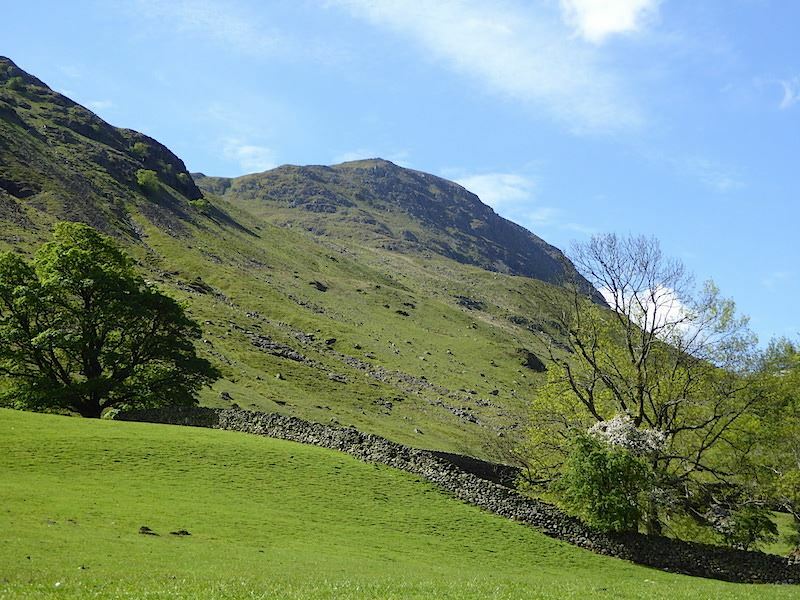 Looking up at the slopes of Saint Sunday Crag. 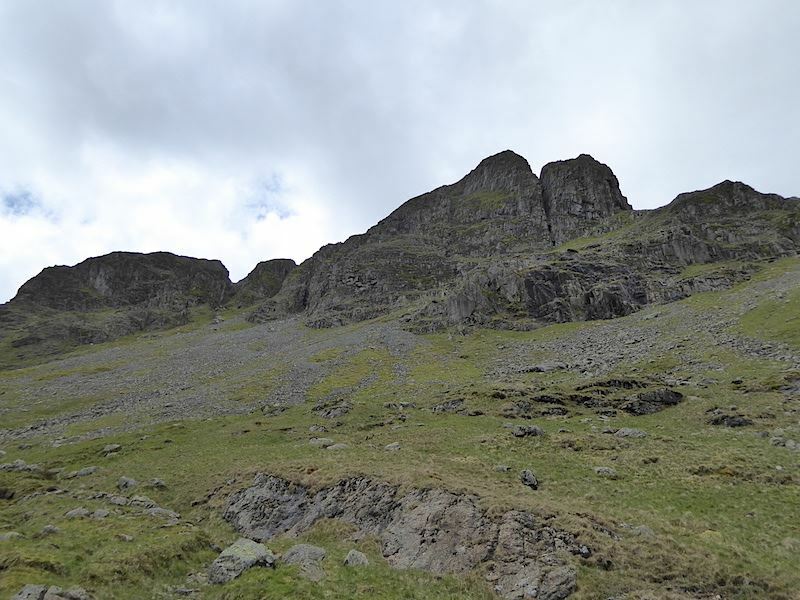 There is a route up to the top through those crags you can see but its not one I’ll ever be trying. 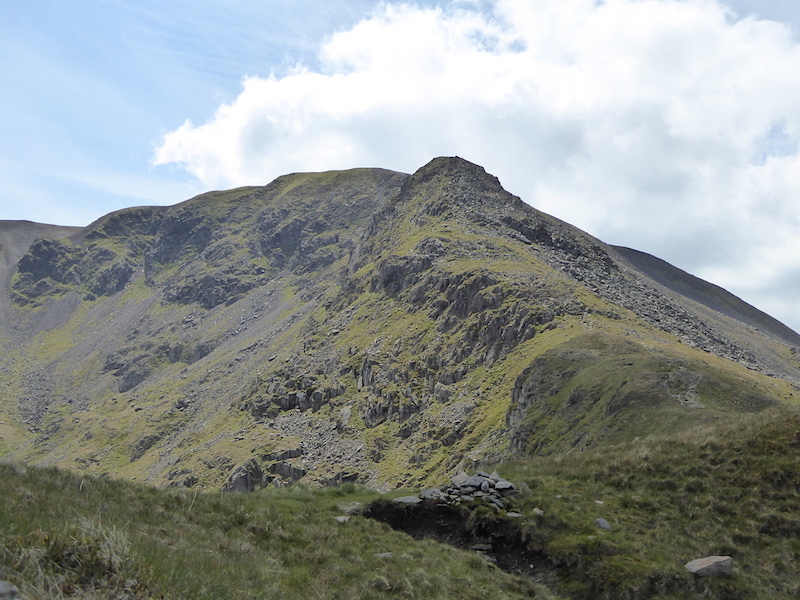 A look up at some of the crags below Dollywaggon Pike. 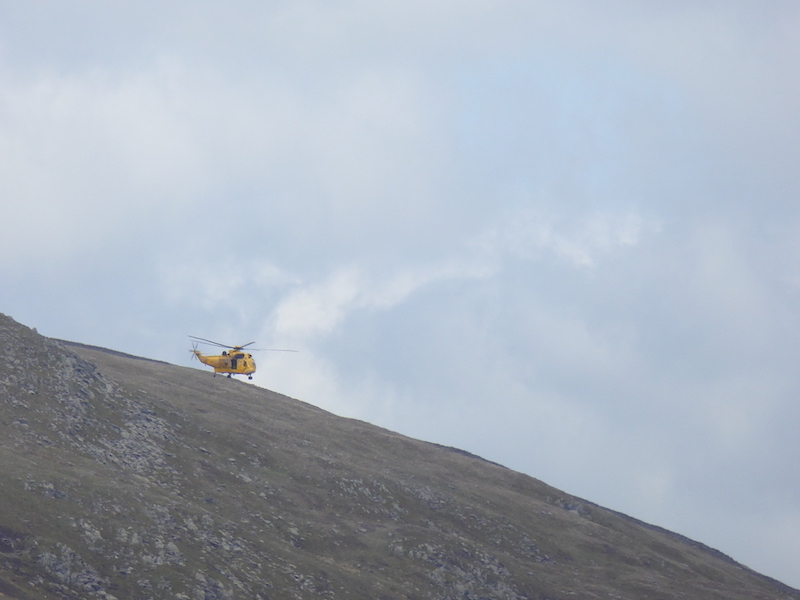 The helicopter did a sweep along Striding Edge. 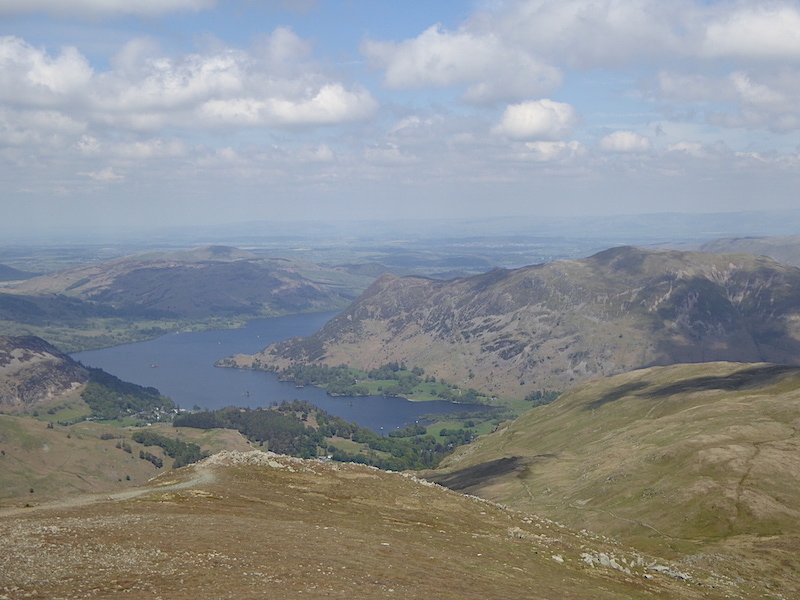 It was windy enough down in the valley so what it must have been like on Striding Edge I didn’t care to imagine. 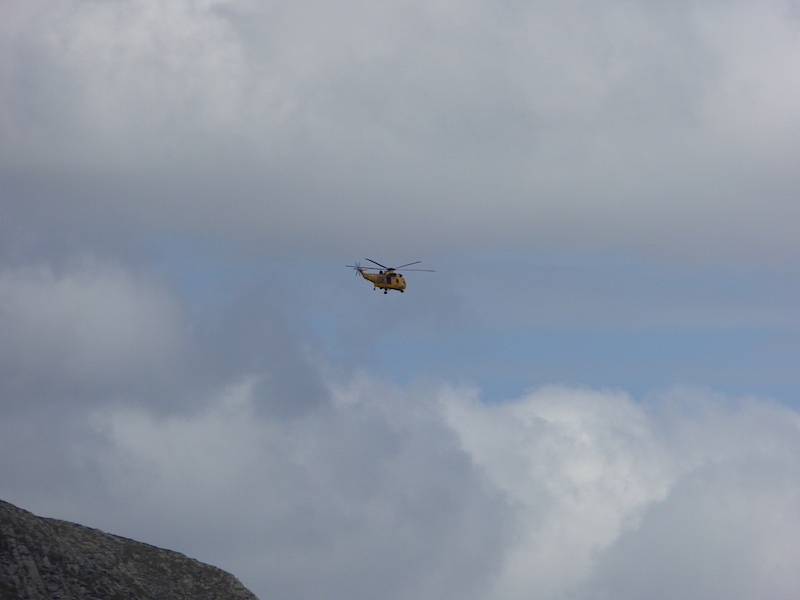 It really was very good of the pilot to wait for me to take the photo I thought. 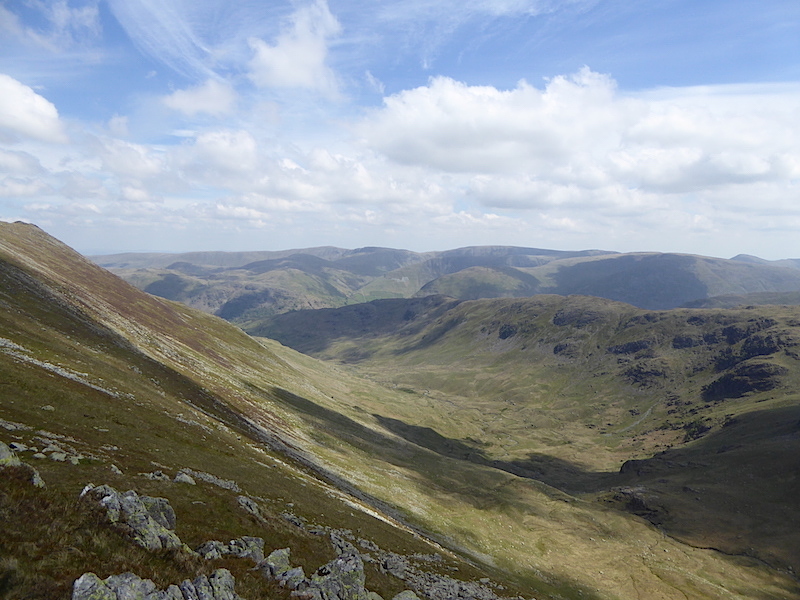 A view across Grisedale to Saint Sunday Crag as we climb up towards Grisedale Tarn. 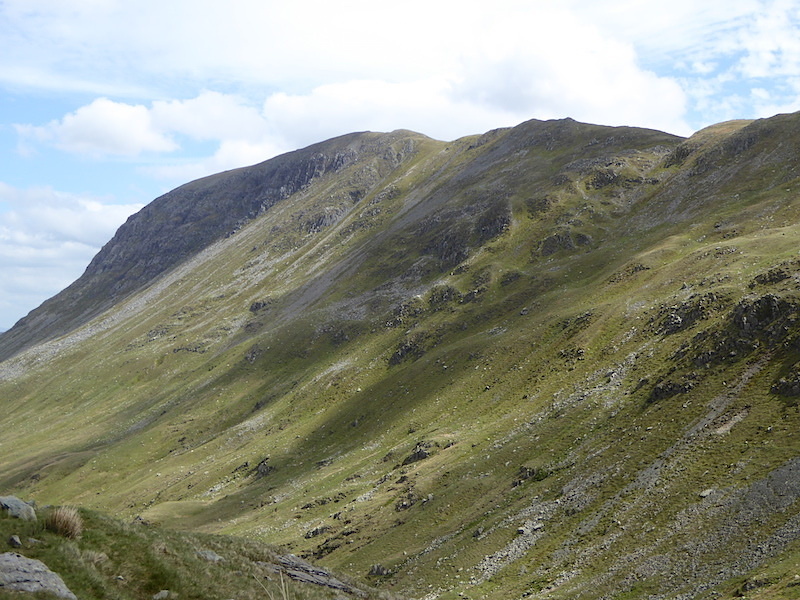 The western slopes of Saint Sunday Crag. 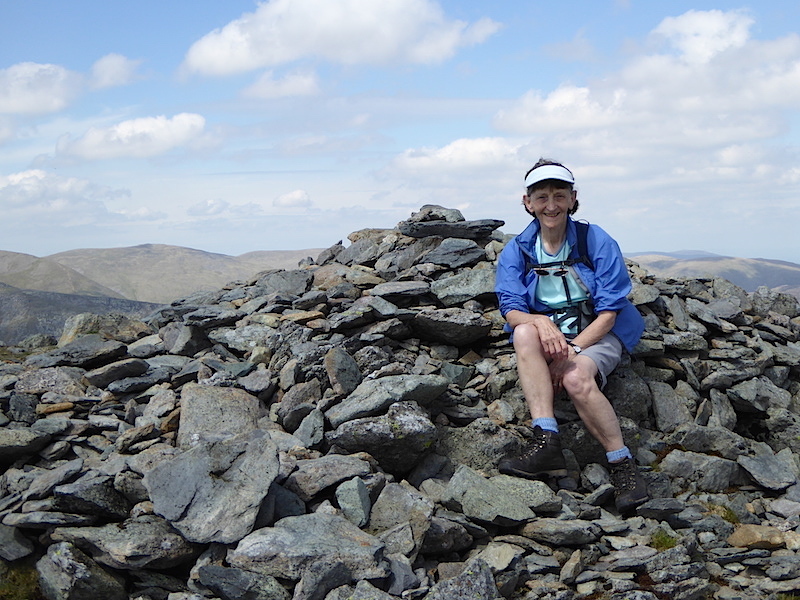 After a long haul up we reach Grisedale Tarn, with Seat Sandal behind it. 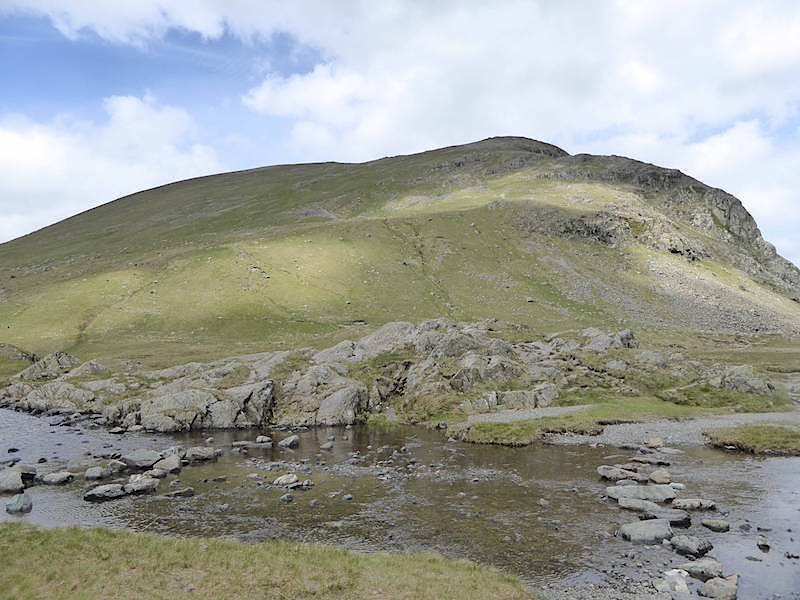 Saint Sunday Crag from Grisedale tarn, it wasn’t half draughty just here. 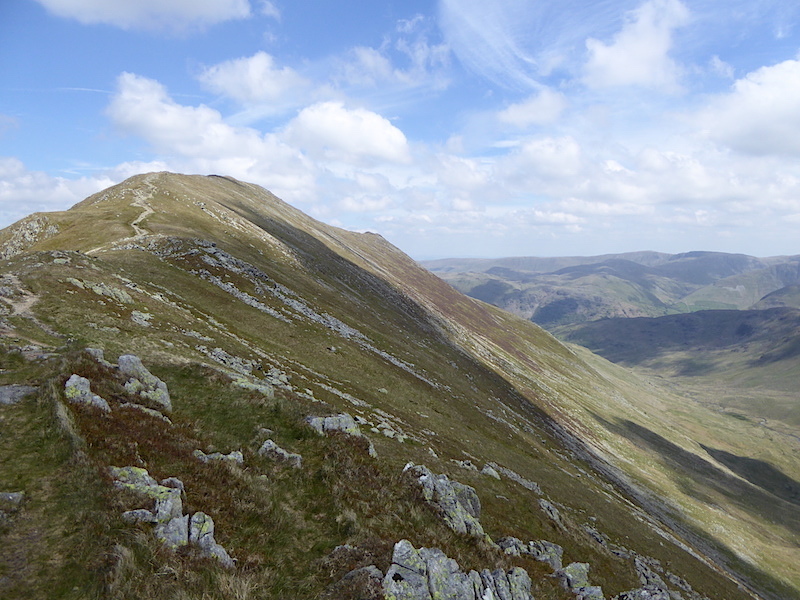 We cross the outflow and take a look back for a view of Dollywaggon Pike. 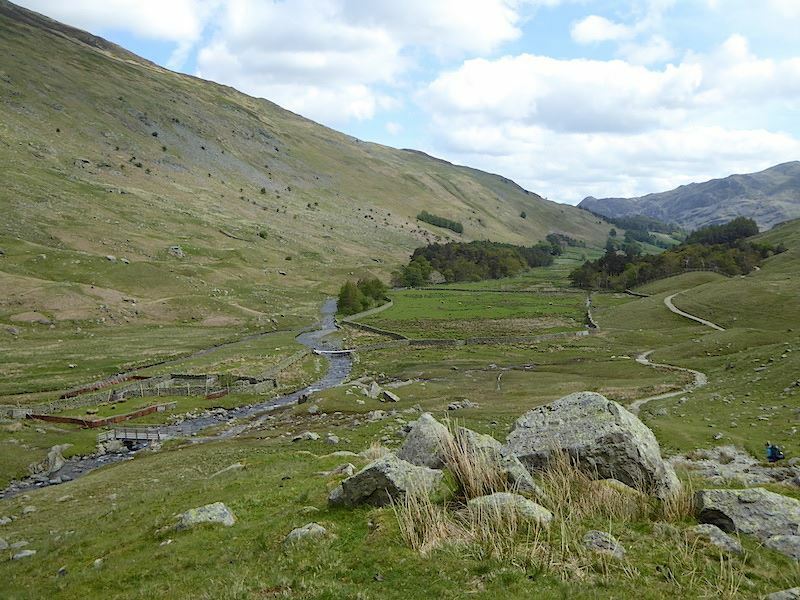 From Grisedale tarn we pick up the path to Deepdale Hause. 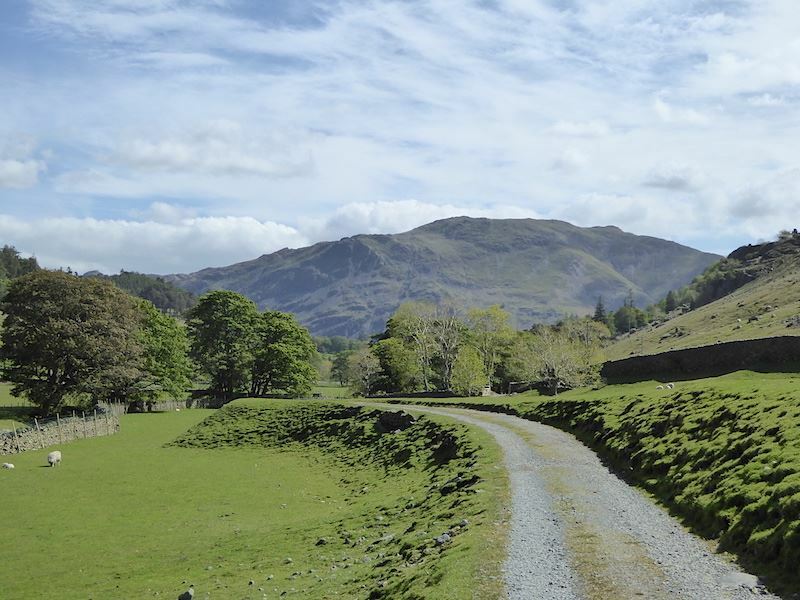 From the path to the Hause there is a good view across to Dollywaggon Pike. 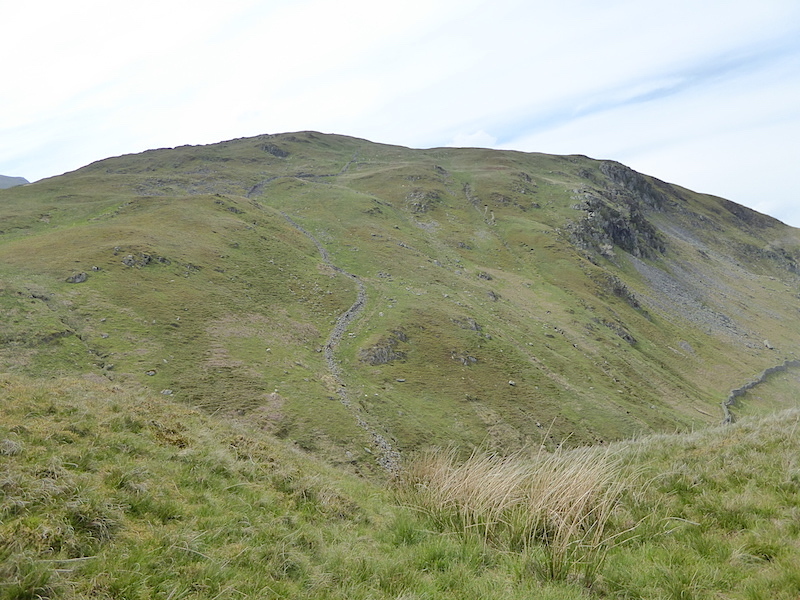 Around the bottom of it is the path we’ve just walked up to get to Grisedale Tarn. 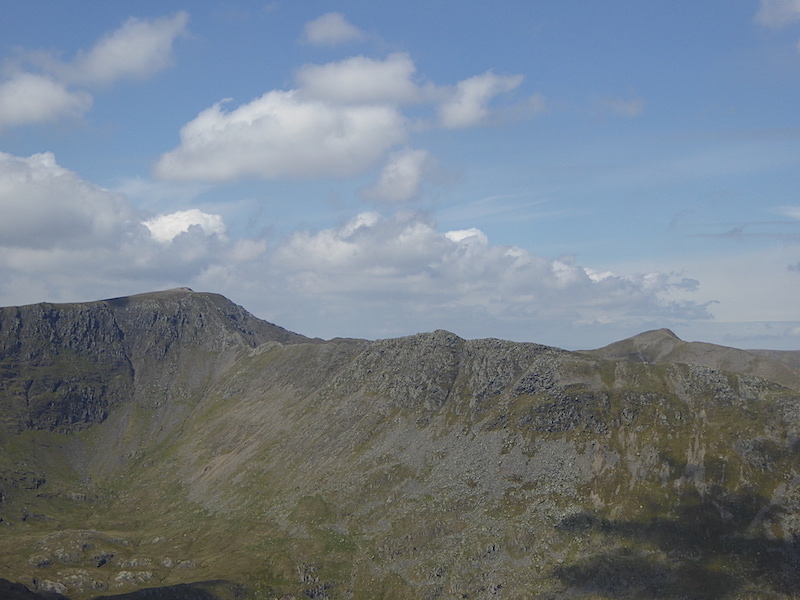 Dollywaggon Pike on the left and in shadow at the far end is the silhouette of Striding Edge. 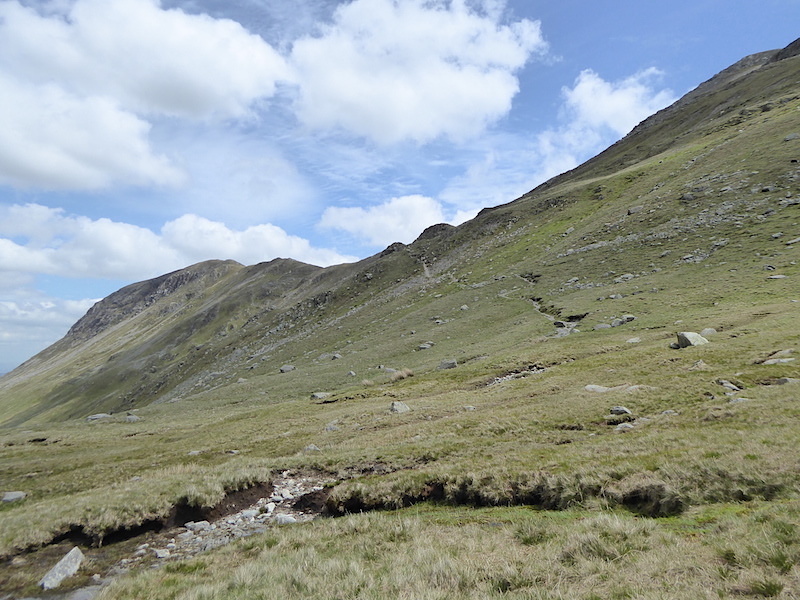 The path down below is the one we followed to climb up to the tarn, there were times when it seemed as though it would never end. 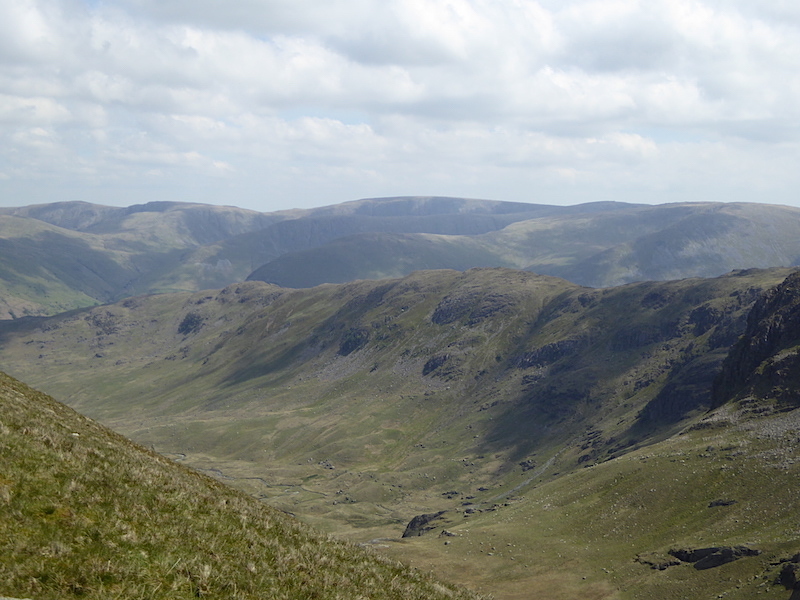 The Helvellyn range from the path to Deepdale Hause. 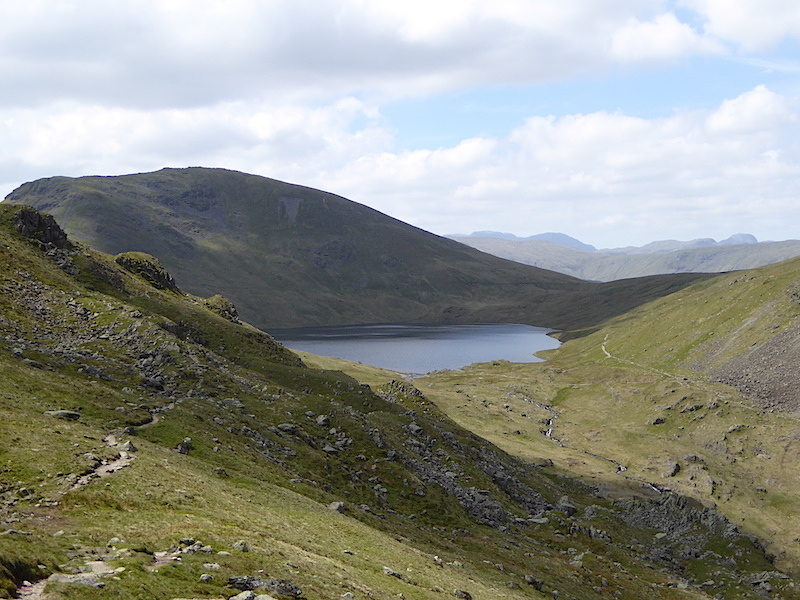 Looking back down the path to Grisedale tarn and Seat Sandal. 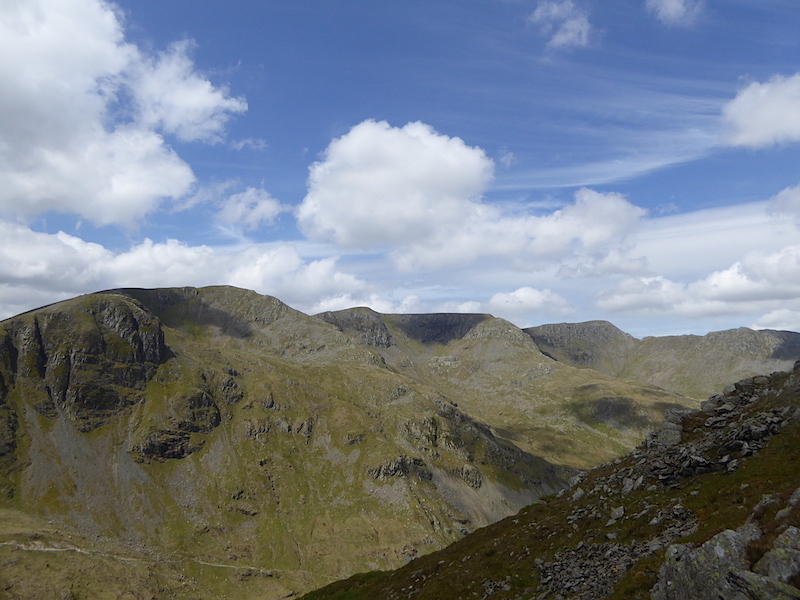 The Helvellyn range again as we continue climbing up to Deepdale Hause, and some lovely fair weather clouds floating above us. 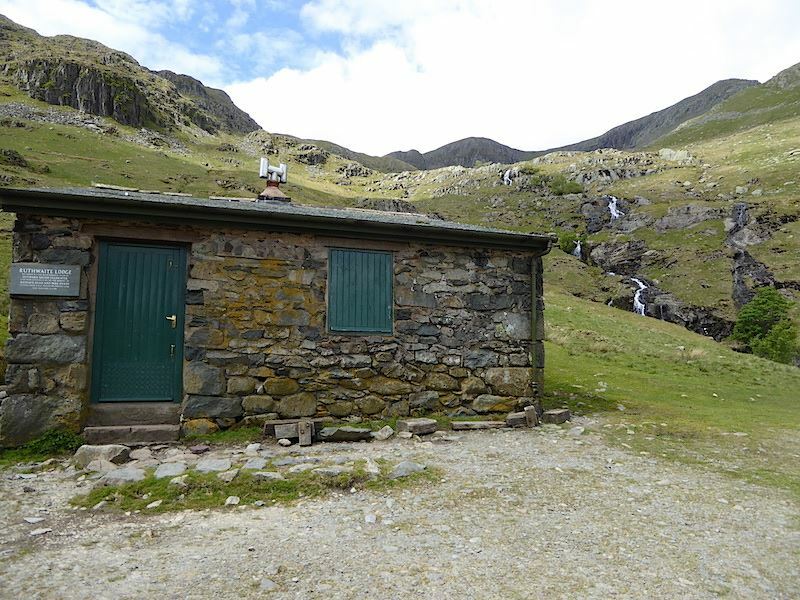 Reaching Deepdale Hause gives a great view of Cofa Pike and Fairfield beyond it. We take a break at the Hause and have something to eat in a sunny sheltered spot. 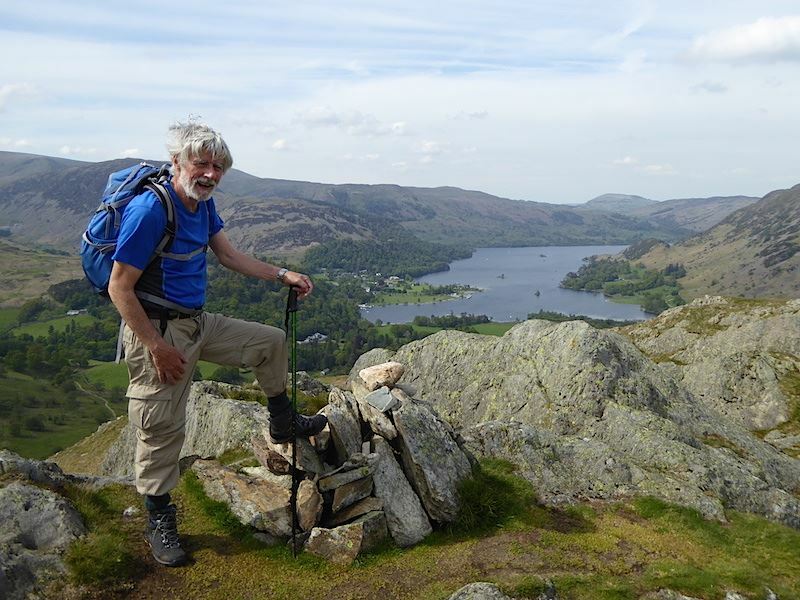 With the lunch break over we continue on to Saint Sunday Crag. 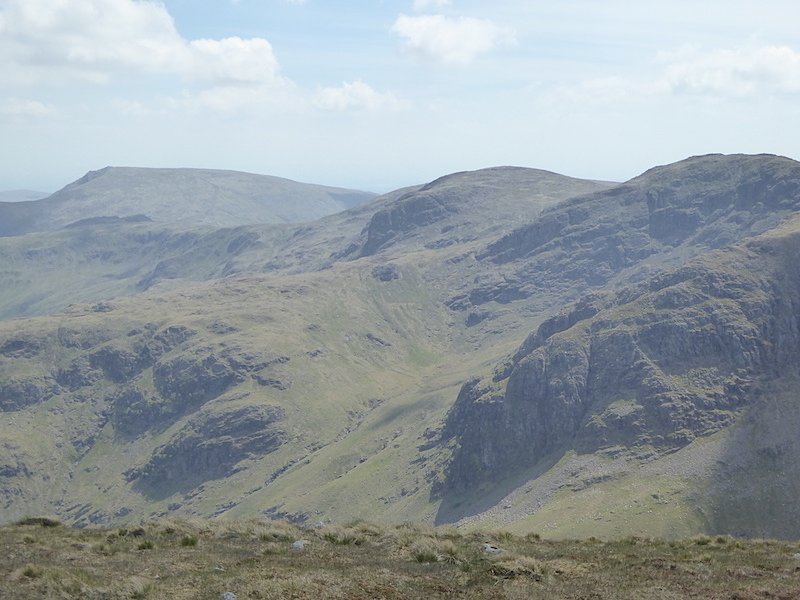 This is the view across Deepdale as we walk the path between Deepdale Hause and Saint Sunday Crag. 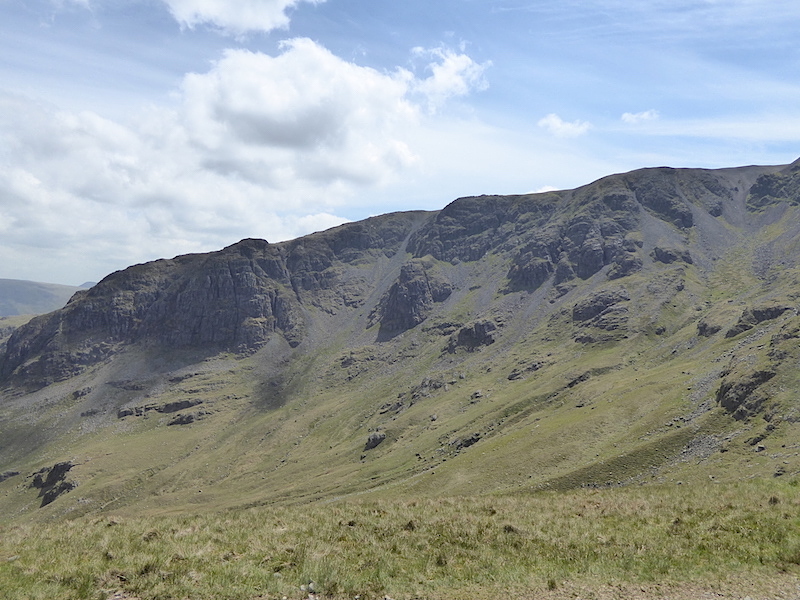 Looking over at the head of Deepdale. 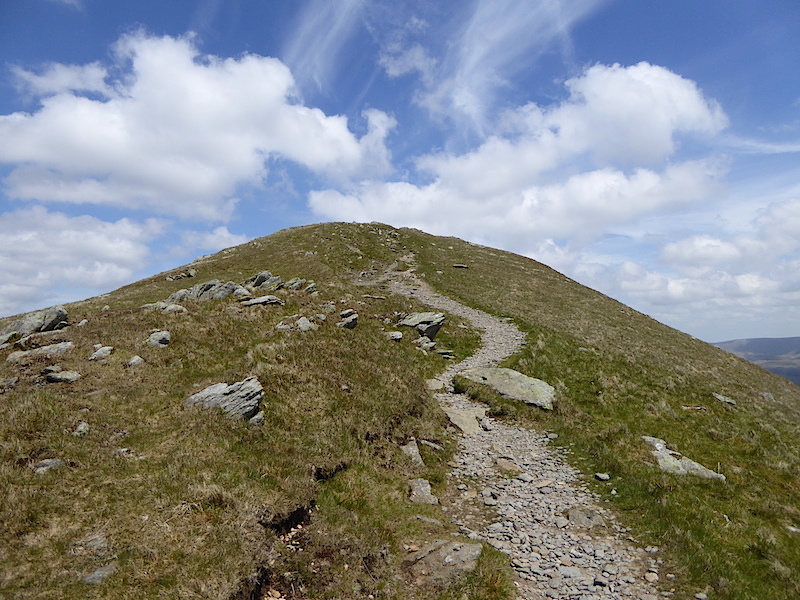 Following the path to Saint Sunday Crag, but that isn’t the summit, not by a long way. 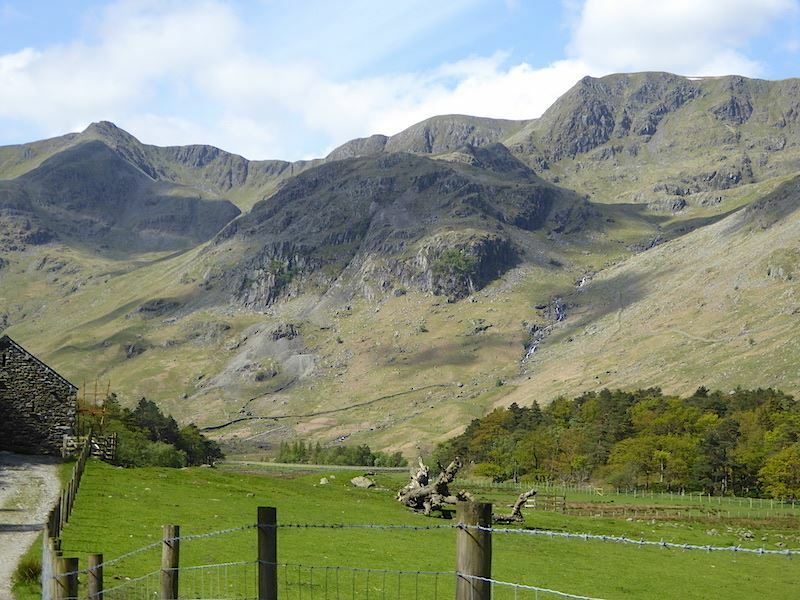 A view across Deepdale to Hartsop above How and the fells to the east. 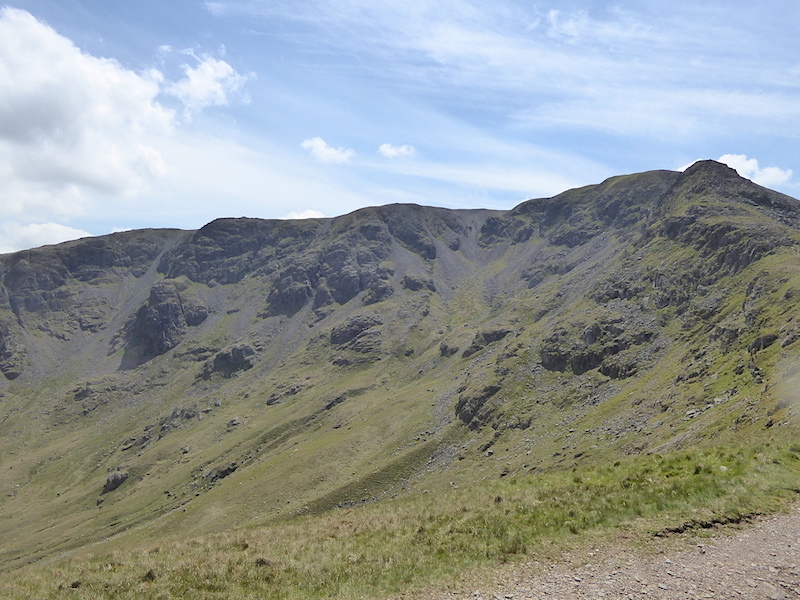 Looking back along the path to Cofa Pike and Fairfield, with Grisedale tarn and Seat Sandal on the right. 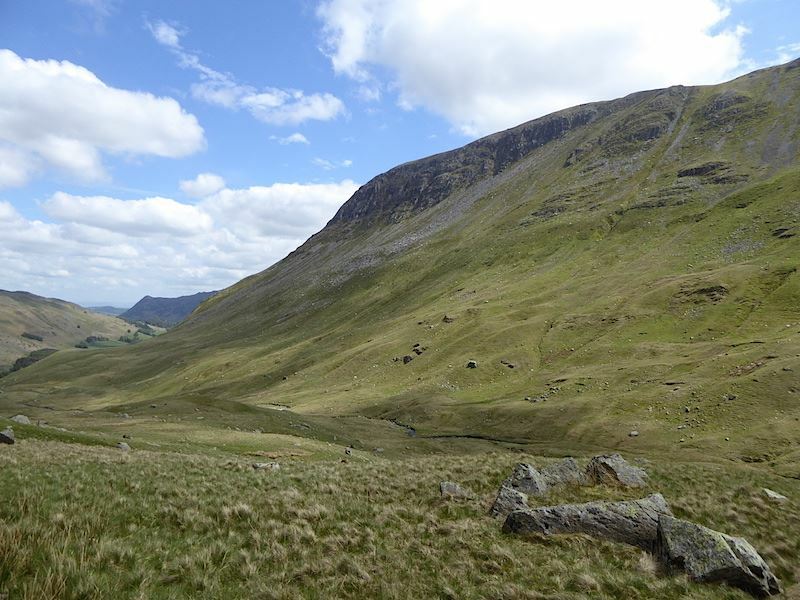 Over on the right of the picture is Dollywaggon Pike with Nethermost Pike just behind it. 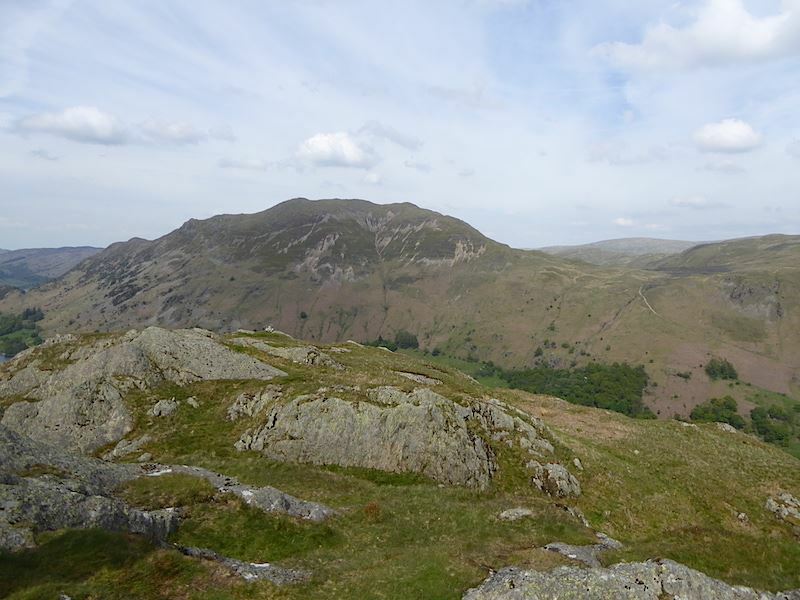 The summit of St Sunday Crag at last comes into view, but its not at the top of that path you can see, its way over at the other end where the knobbly bit is. It was very windy across here and thoughts of getting the gloves out came to mind. 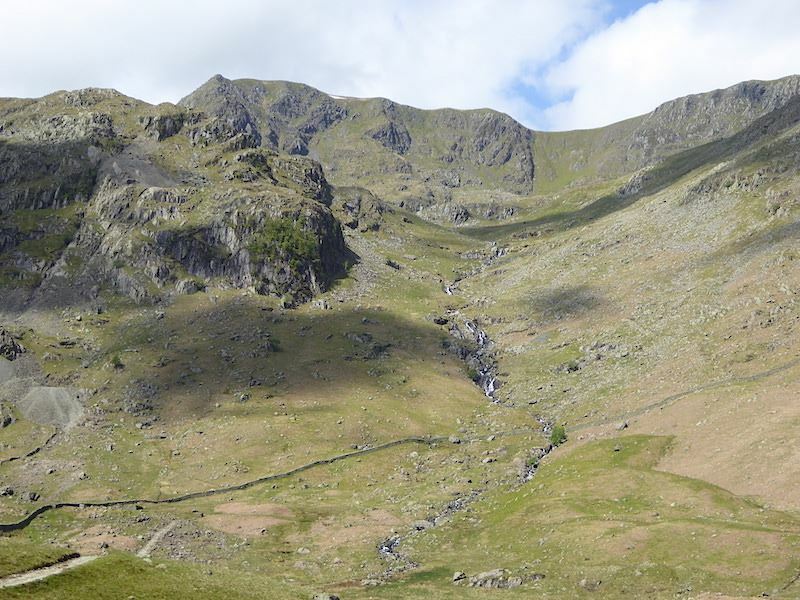 The eastern slopes of Saint Sunday Crag dropping down into Deepdale. 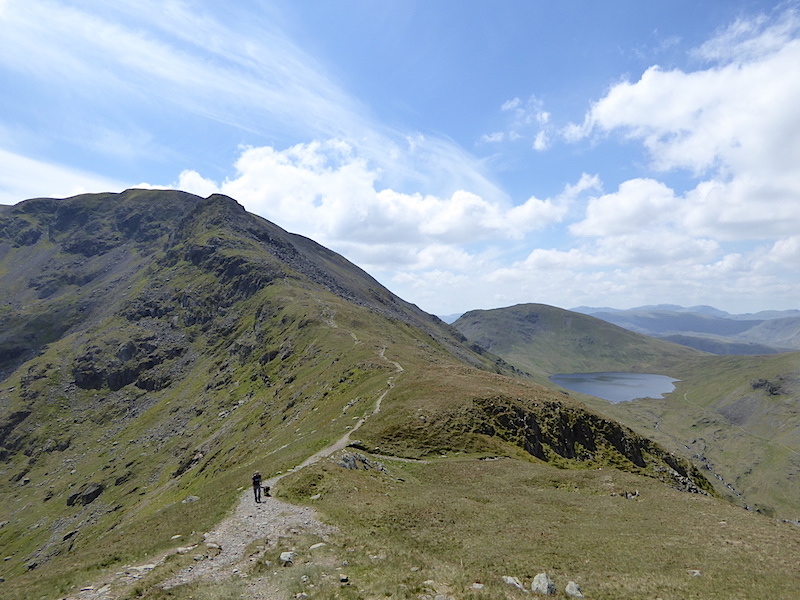 There’s a good view of Helvellyn up here, that’s it on the left, with Striding Edge in the middle, and Catstycam over on the right. 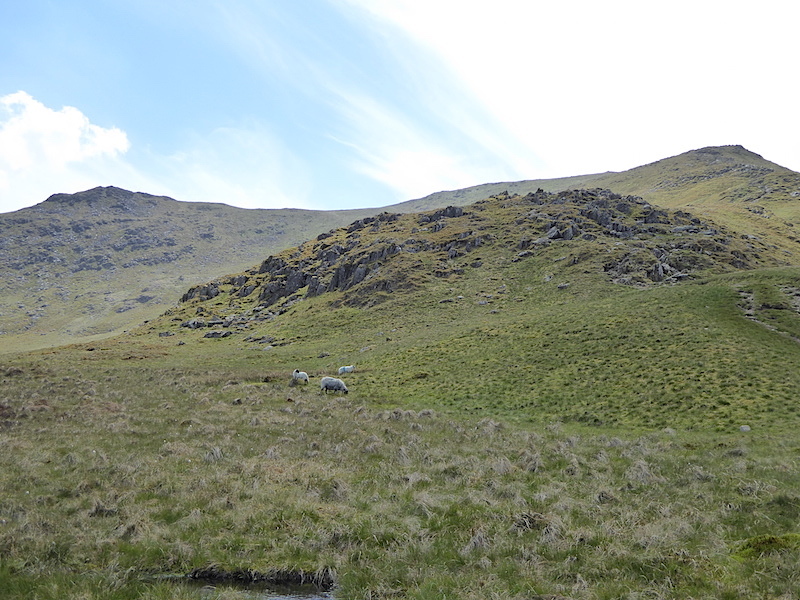 The distinctive mass of Red Screes, over on the left of the photo, across Deepdale. 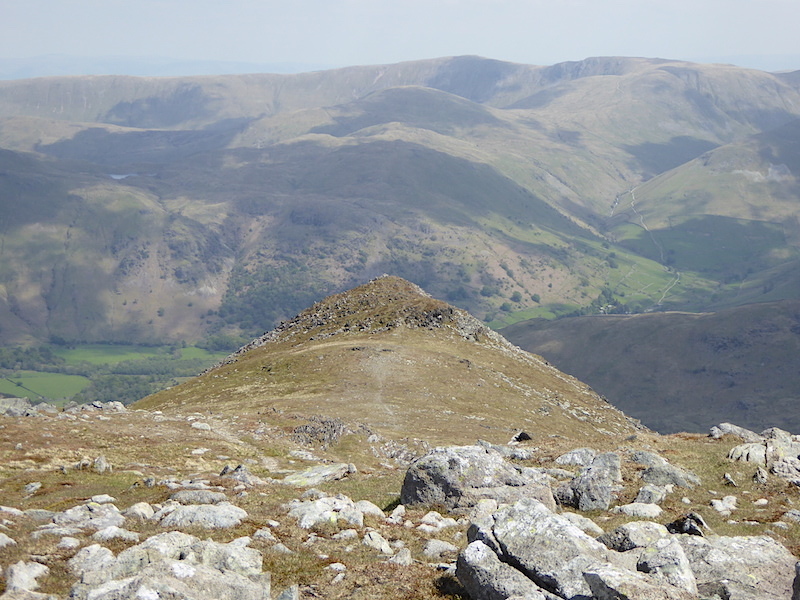 From Saint Sunday Crag summit a view down to Gavel Pike and the merest glimpse of Angle Tarn to the left of it. 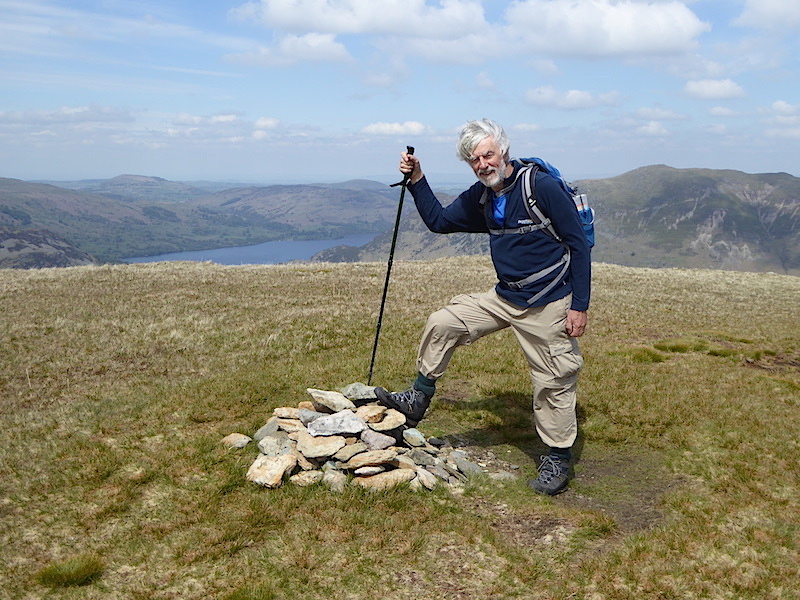 Saint Sunday Crag summit cairn and, as you can see, the wind is still a nuisance with walking poles coming in useful as anchors. Sitting down is a lot easier than battling the wind, I’m all for the easy option. 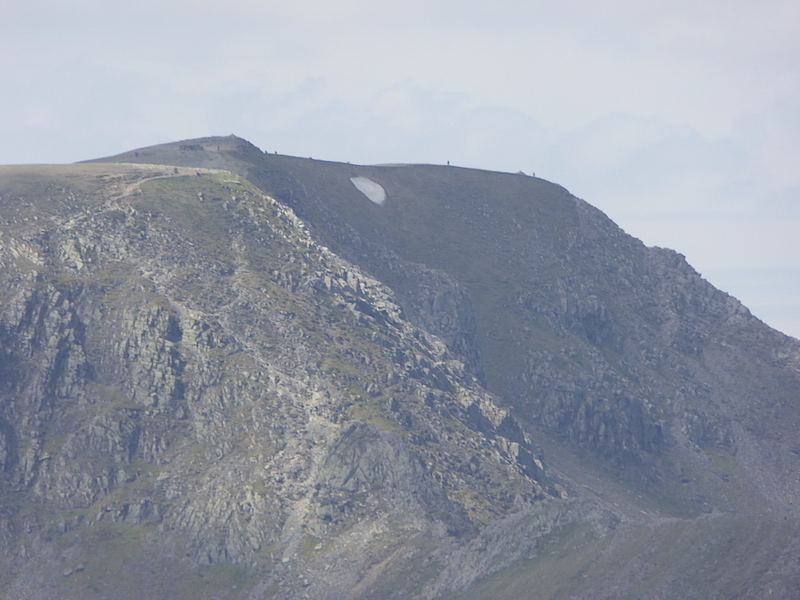 A long zoom to catch the activity on Helvellyn, still with a lingering patch of snow. 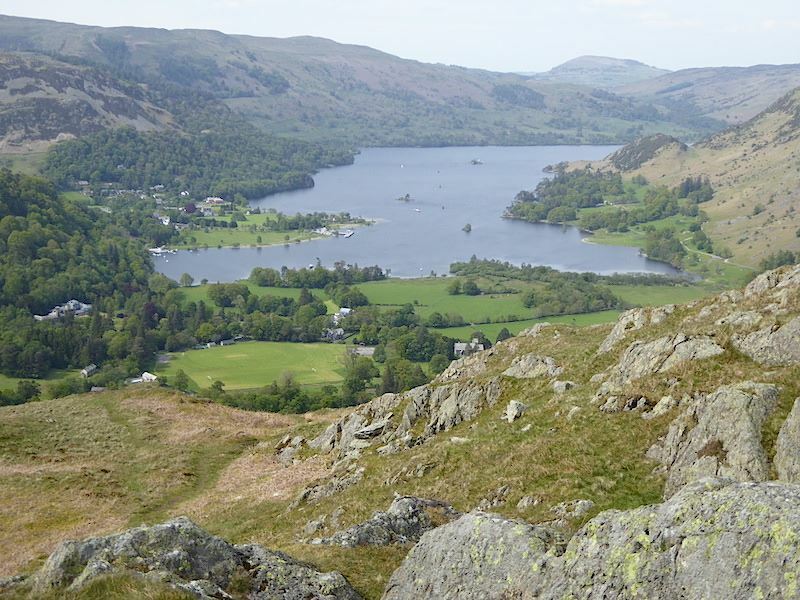 A fabulous view of Ullswater from the north cairn on Saint Sunday Crag. 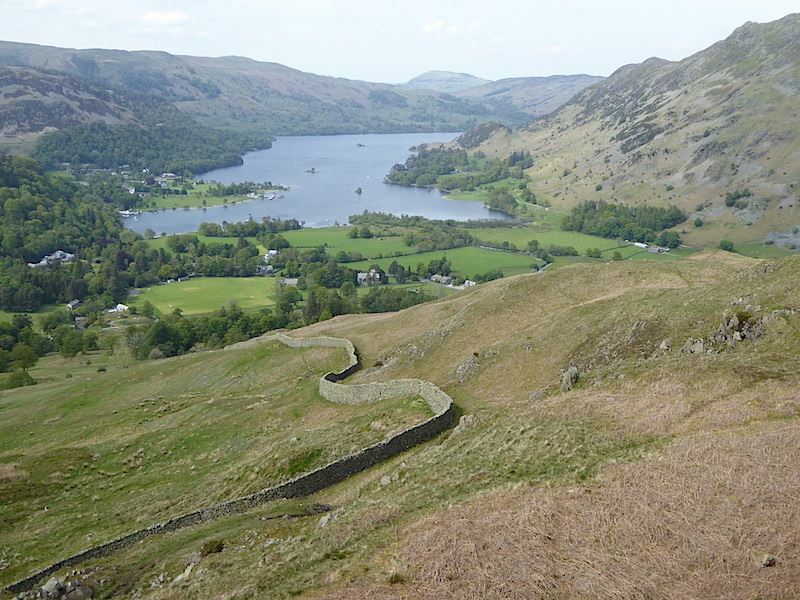 Ullswater again and on the left of the picture is the path we’ll use to descend, that way we can hold on to the view a little longer. 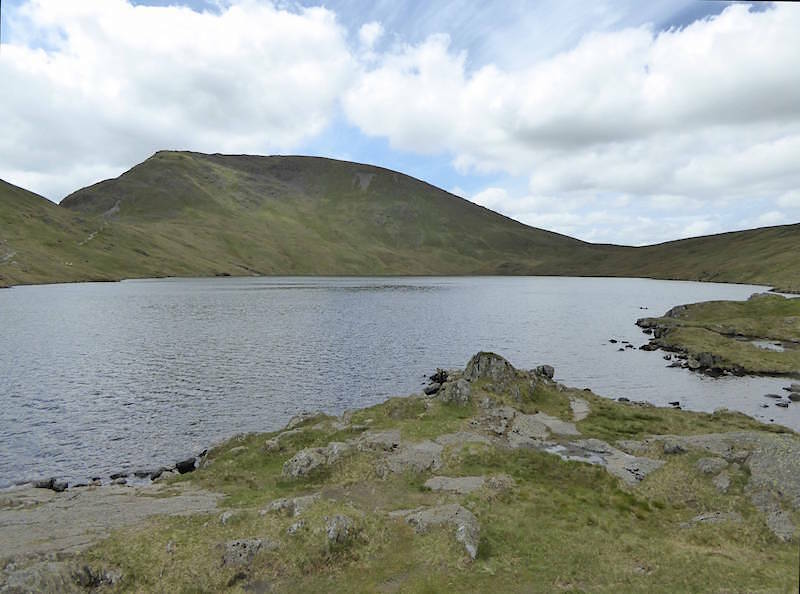 Over on our right we get a glimpse of Angle Tarn. 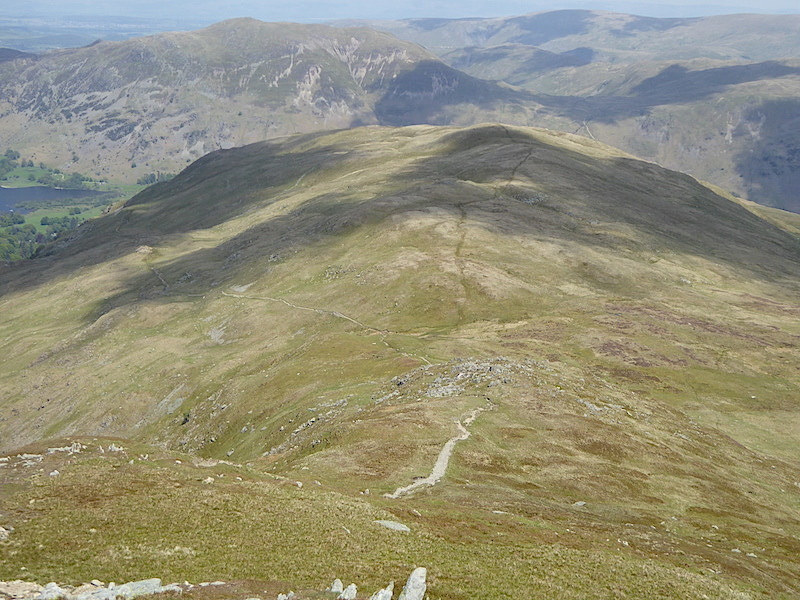 Looking down to Birks, the next fell on the itinerary. 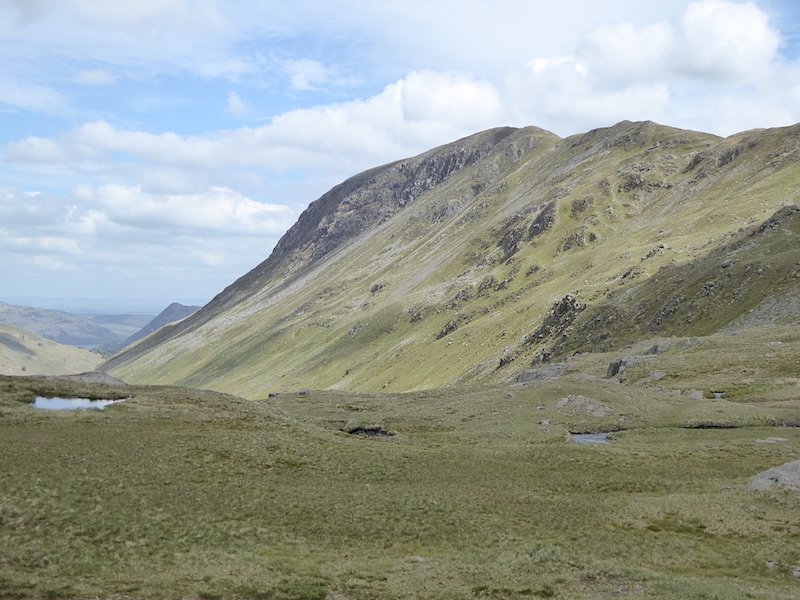 A look back at Saint Sunday Crag on the right and Gavel Pike on the left as we make our way over to Birks. 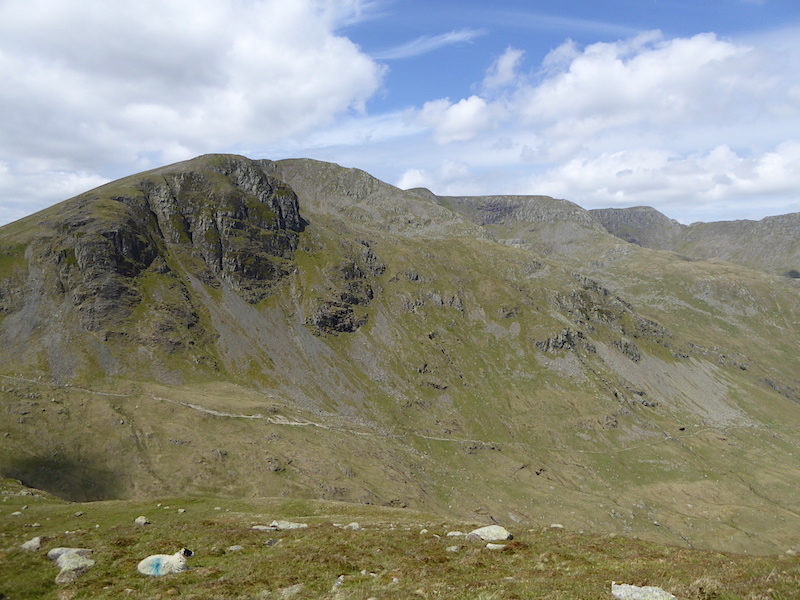 A bit further along the path to Birks and I take another look back at Saint Sunday Crag. 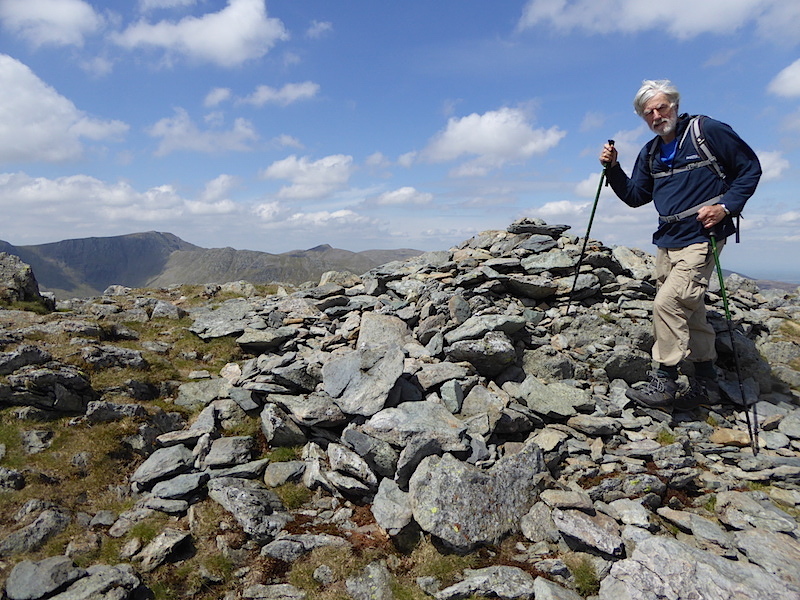 Its all rather flat on the top of Birks so why not have a go at the challenging east ridge of the summit cairn. 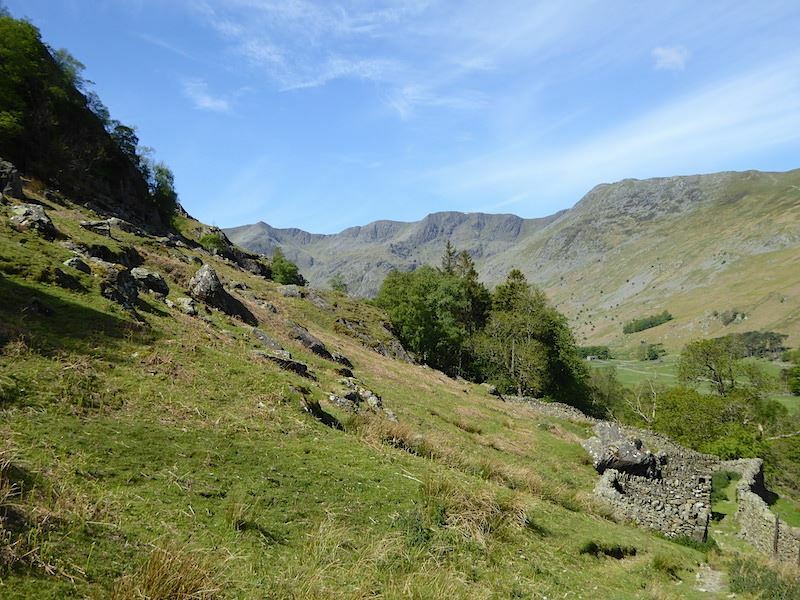 Dropping down from Birks and following the collapsed wall on the way to Arnison Crag which is at the end of the longish ridge across the middle of the photo. Birks and the collapsed wall down the centre which we have just followed down. About halfway down the wind dropped which made things feel considerably warmer, but you can see that a thin veil of cloud arrived so that was pretty much the end of the sunshine for the day. 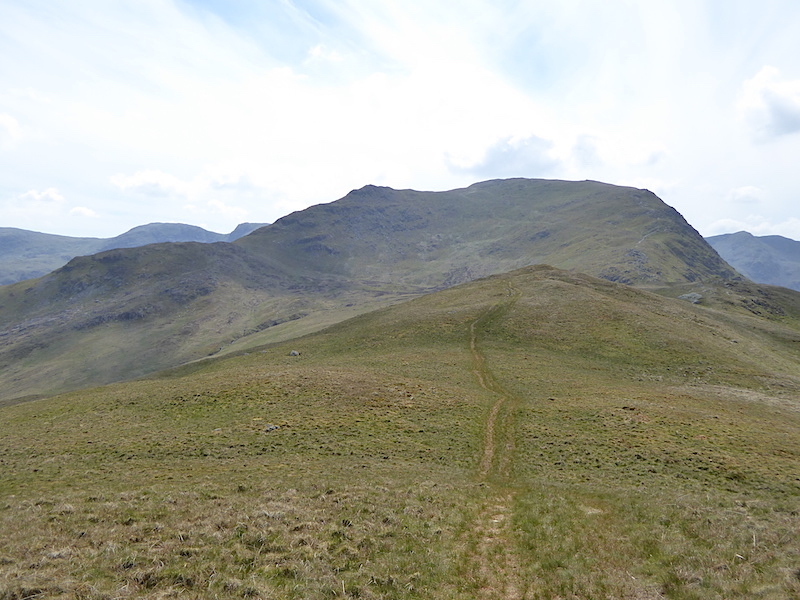 Place Fell on the left, Angle Tarn Pikes on the right, and the path to Arnison Crag through the centre. 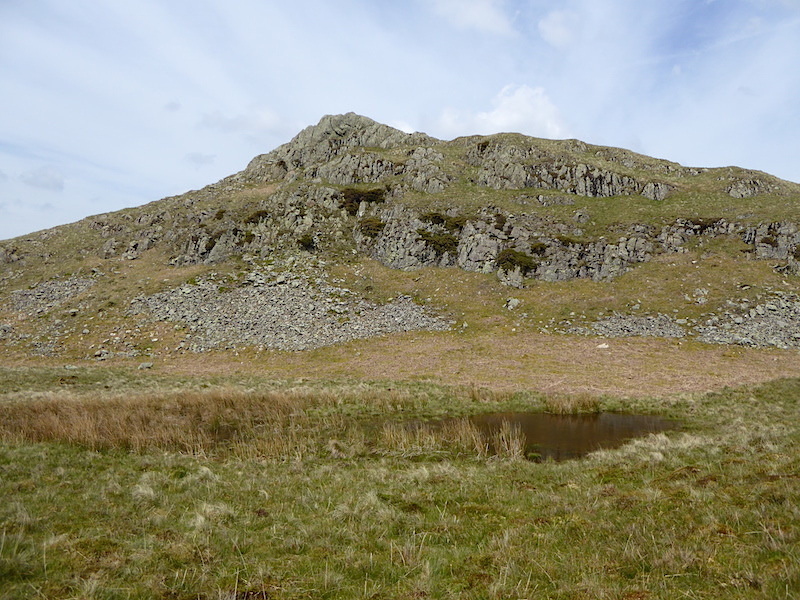 Arnison Crag and its reedy tarn. From Arnison Crag a view of Hartsop Dodd to the right, and Thornthwaite Crag in the centre, with the little hamlet of Hartsop below them. 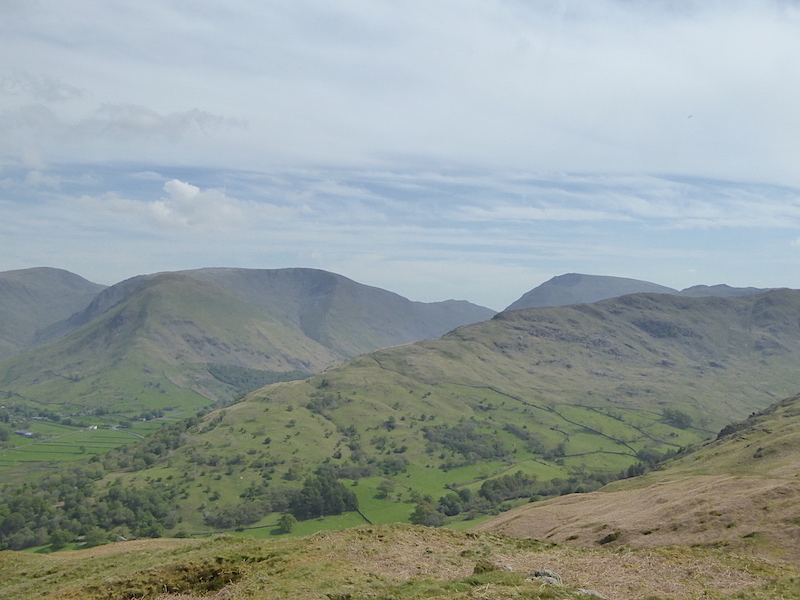 Looking over Hartsop above How, which is the long ridge running diagonally across the centre, to Hartsop Dodd, Caudale Moor and Red Screes. 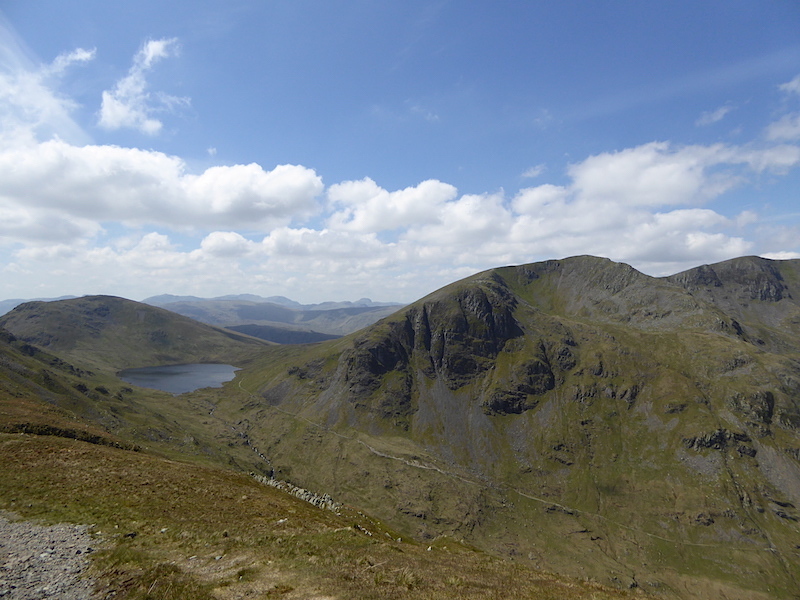 The twin peaks of Angle Tarn Pikes from Arnison Crag. 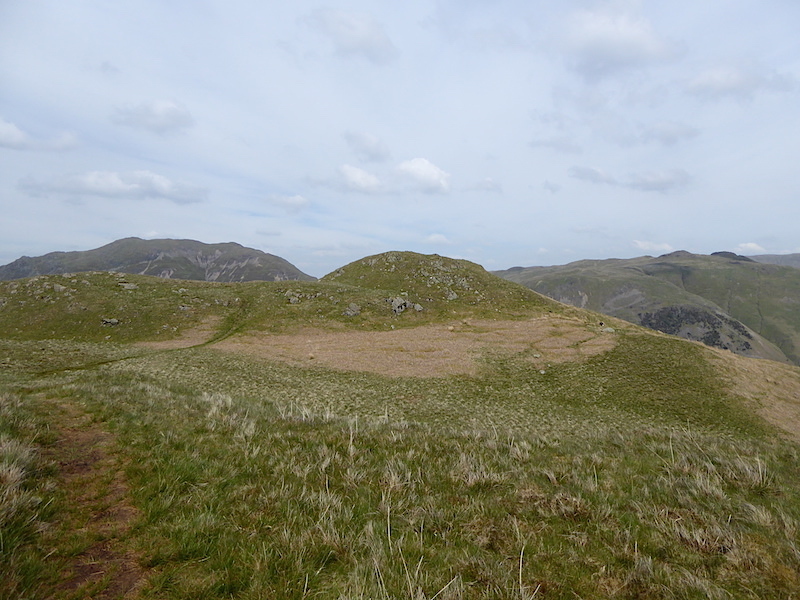 The summit of Arnison Crag. Looks like a visit to the barber will be on the cards before too much longer. 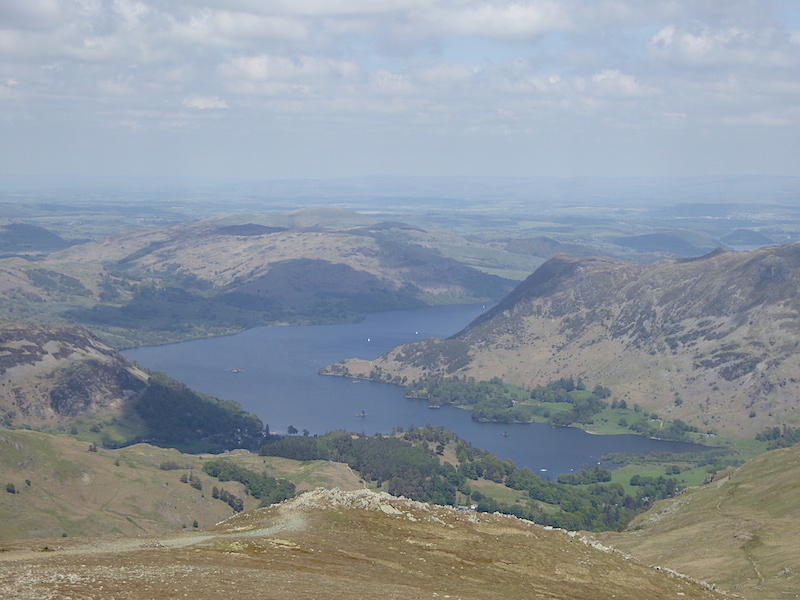 Another lovely view of Ullswater from Arnison Crag summit. 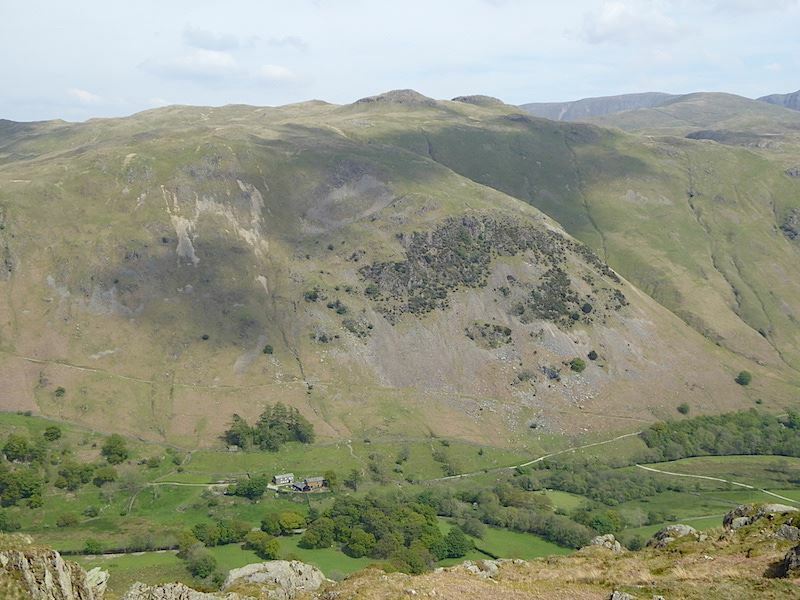 Place Fell from Arnison Crag. I never tire of this view, its just lovely, especially on such a nice day. 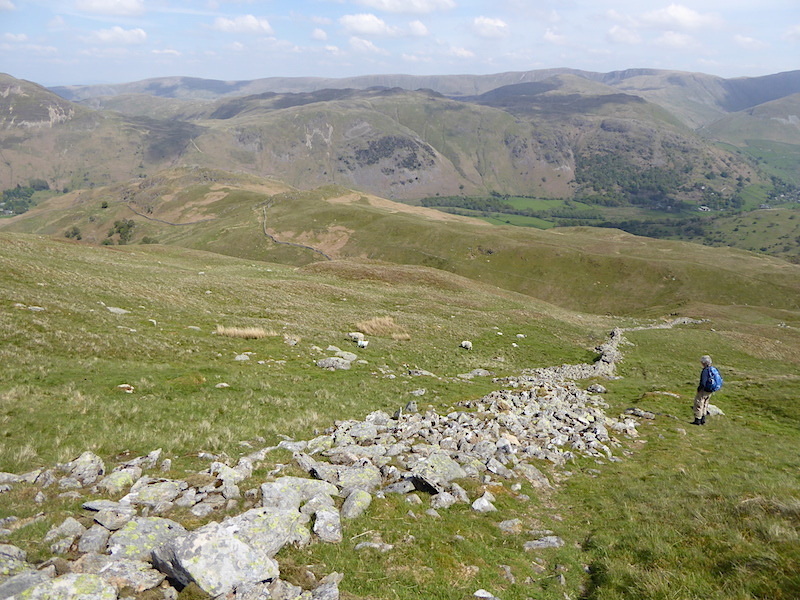 Leaving Arnison Crag, you just follow the wall straight down to Patterdale. 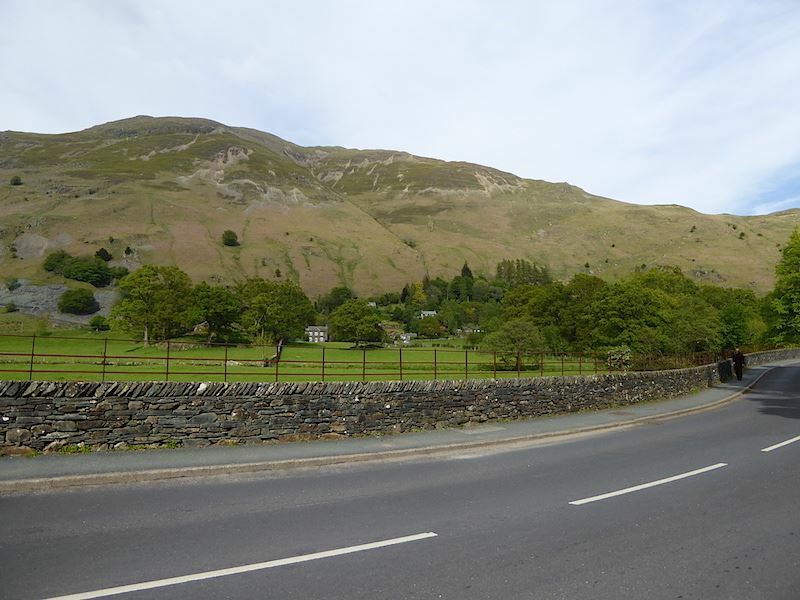 Back at the car in Patterdale with a view of Place Fell before we go. 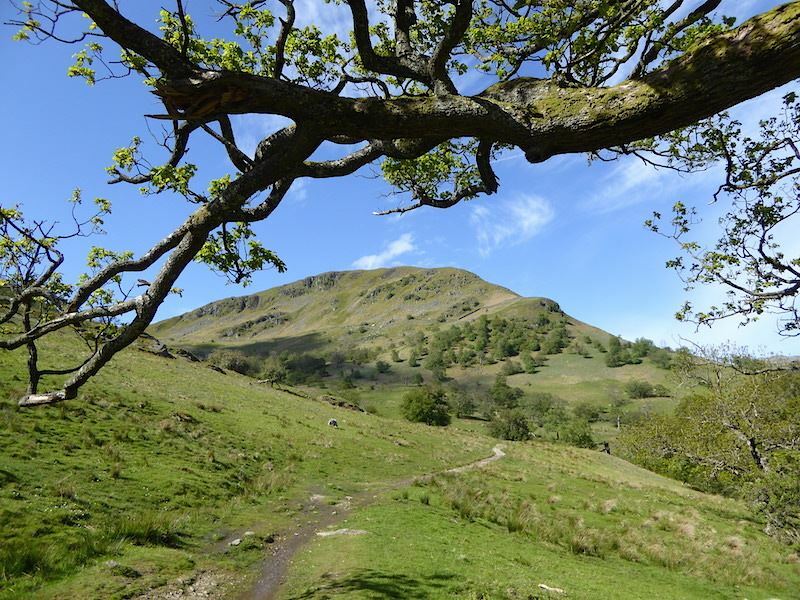 There were plenty of other walkers around now, unlocking cars, removing rucksacks, changing boots, and all the other end of walk activity which goes on wherever a group of cars are parked. It can be highly amusing to observe, discreetly of course.